Empty Nesters Are Enjoying Themselves. And the Mayor of the Marsh Is Back. This week’s been hot, and I’ve been busy. 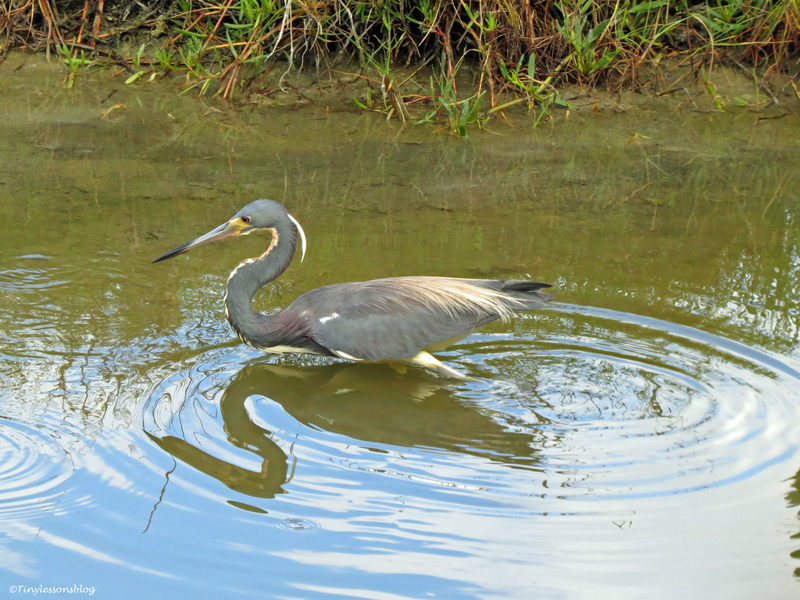 Since my sunrise walk on Monday, I only went to see my feathered friends around the salt marsh today at lunch time. But wanted to say a quick hello before the end of the week. 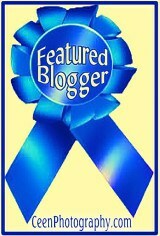 So you know I’m still alive and well, and looking forward to catching up on your blogs over the weekend. 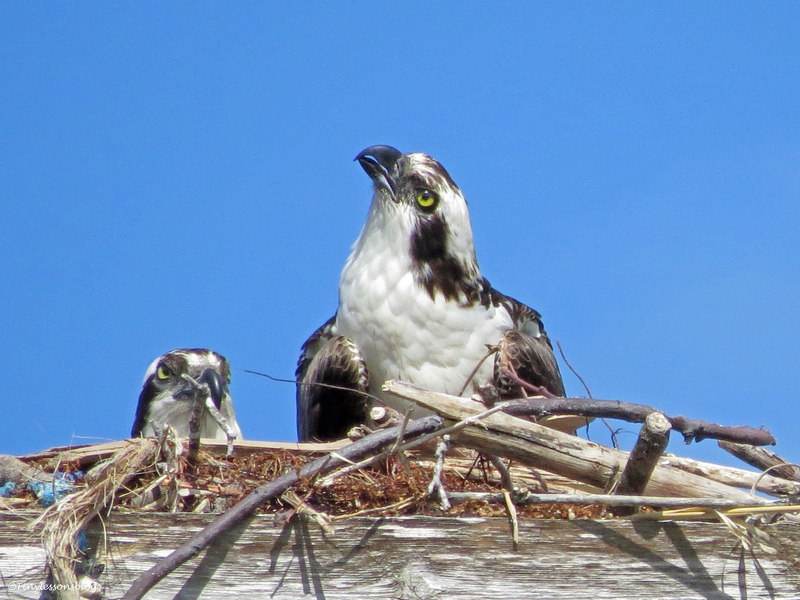 Mama and Papa Osprey are empty nesters since ten days, as many of you know. 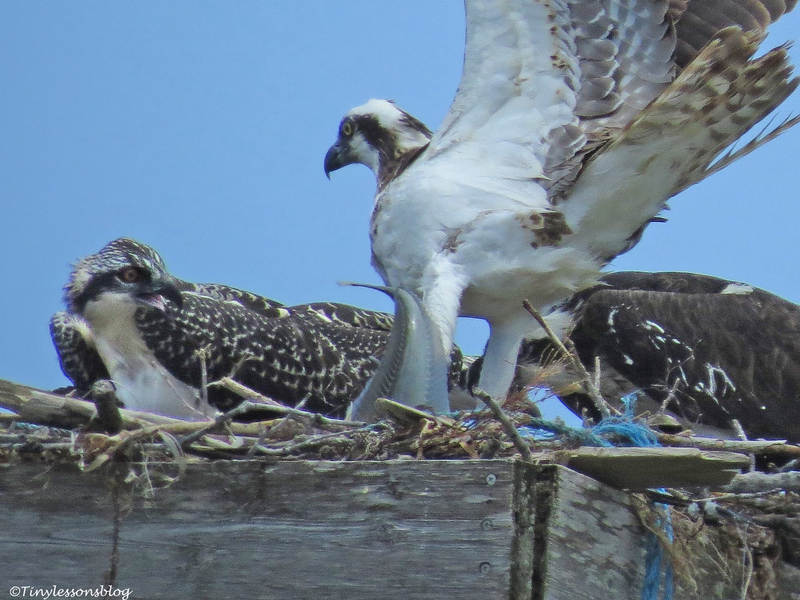 But they are staying close to each other, which is a bit unusual for Osprey once the nesting season is over. 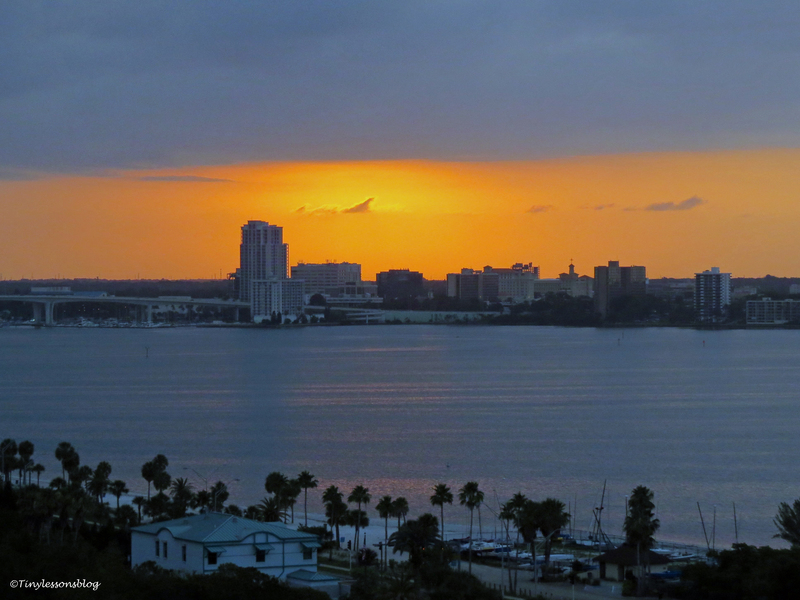 They’re perching on the bay side – featured image taken from my terrace on Wednesday night at sunset. Or flying together and chatting. 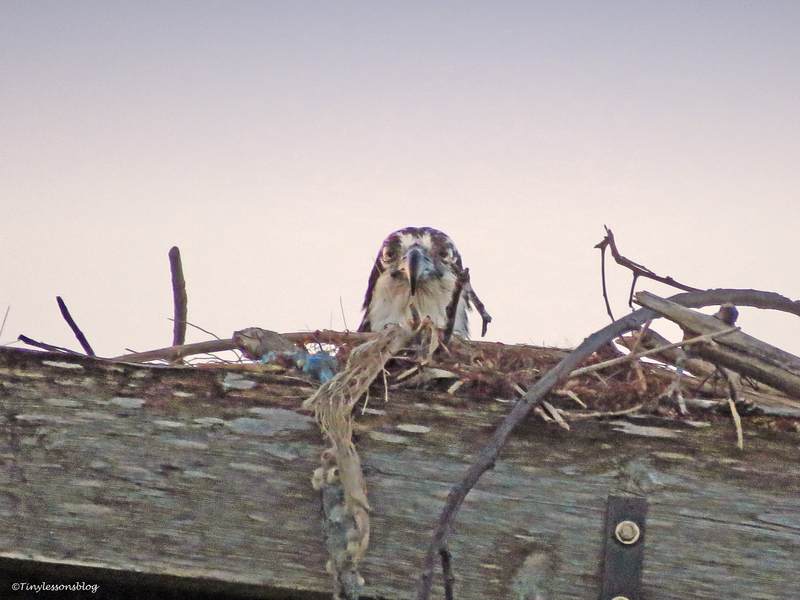 Last night when it was too dark for a photo shoot, but not for my new binoculars, I spotted them perching at the Sailing Center. Each at the top of a sailing boat mast, next to each other. That was too cute. 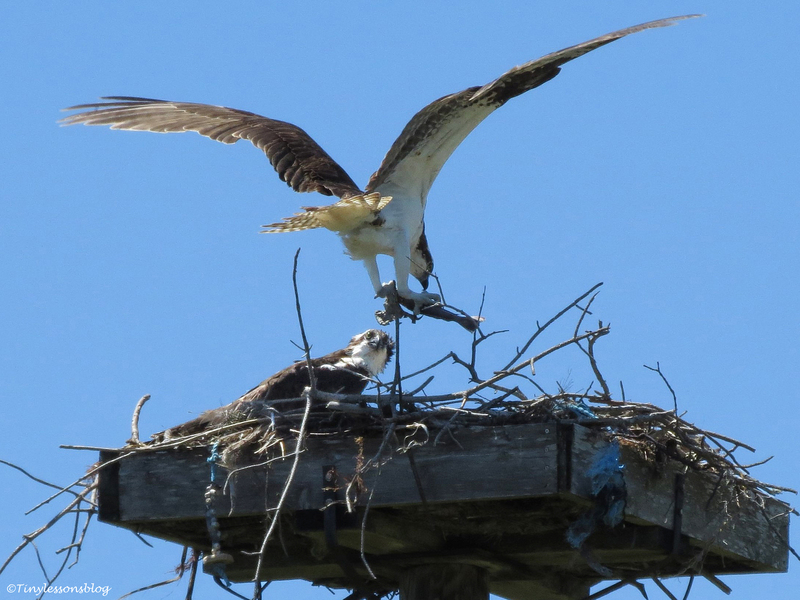 Mama Sandy uses the nest as her feeding and resting perch. Today her crop was really full. 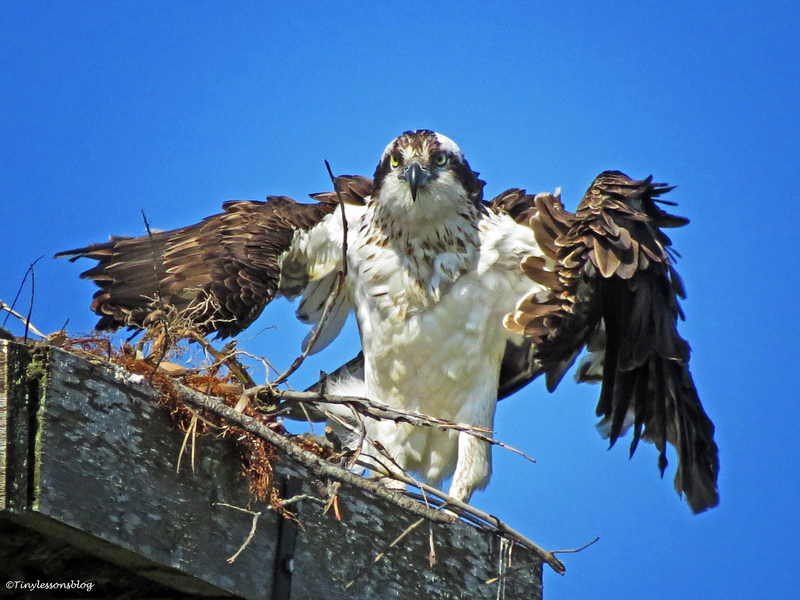 Mama Sandy has been at the nest several times since she came back to the area last weekend. Today she was perching there again. Her crop was really full. She must have eaten a huge fish for lunch. Finally she has time to take care of herself. And I spotted Stanley too. He was still planning what to have for lunch. Scanning for fish high up on the roof of Marriott Resort on the bay side. That’s one of his favorite spots. Excellent visibility into the clear water below. The fish he craves for is likely to be his. Papa Stanley checks his lunch options at the corner of Marriott’s roof. At the salt marsh, the “Mayor” is back! 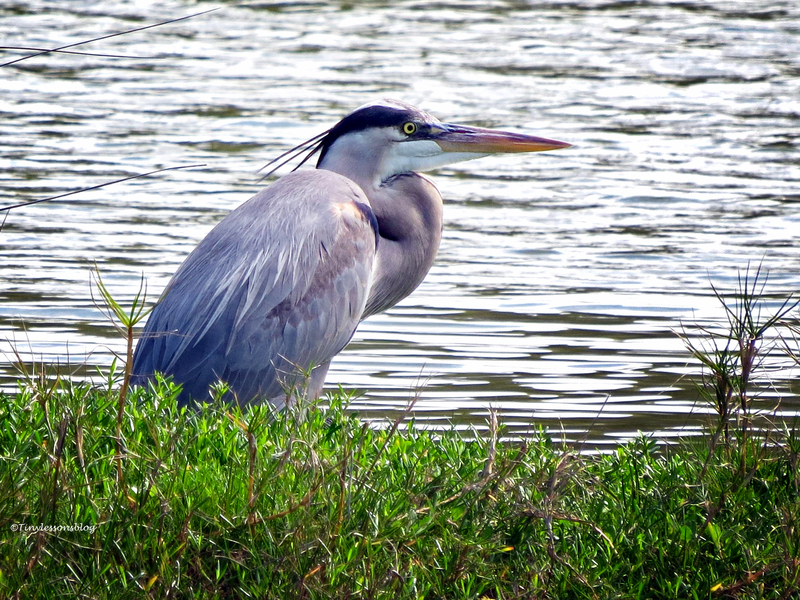 Some of you may remember the older Great Blue Heron who keeps order among the moorhens, egrets, ducks, other herons, the many ibis families and all the smaller birds. The “Mayor” surveys his community. Not that he needs to work hard. This is usually a well-mannered crowd. 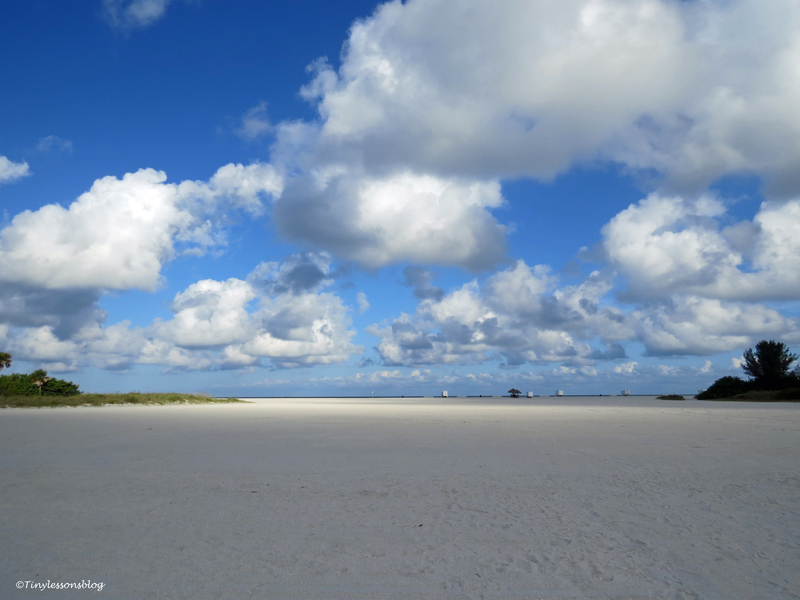 There are plenty of nice spots at this resort, and the smorgasbord in the shallow waters has something for everyone. 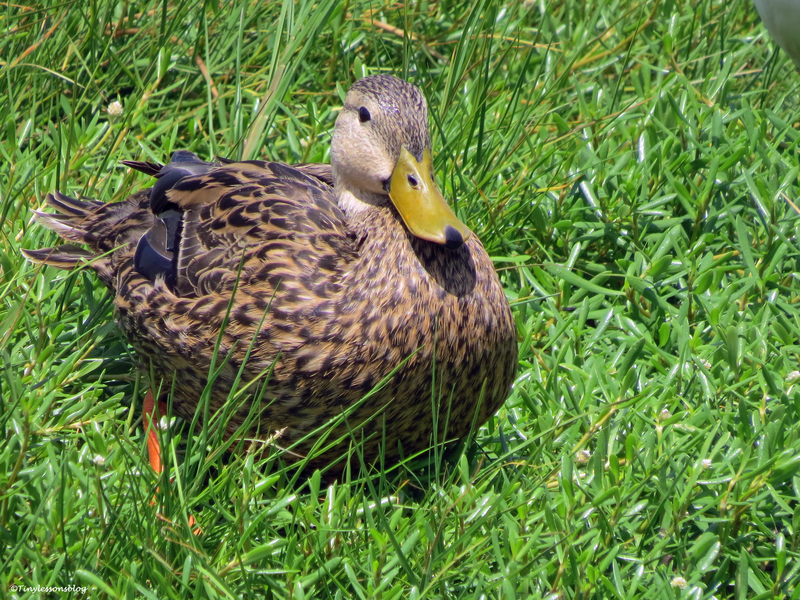 A female Mottled Duck enjoys a nice spot in the grass. 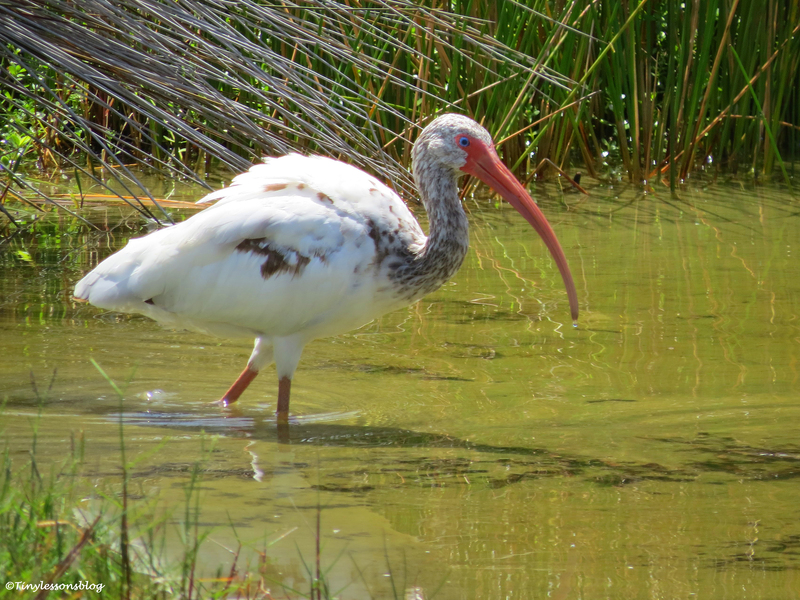 The young ibis is still around, now foraging on his own. 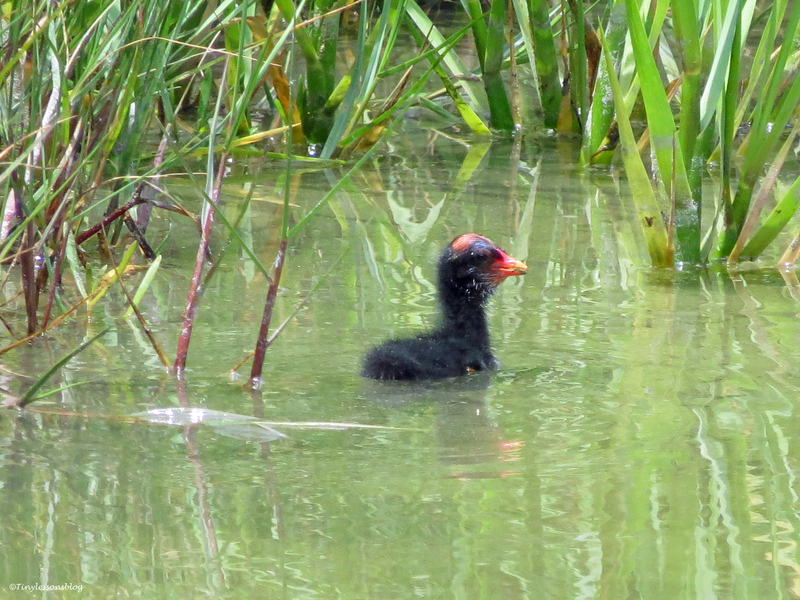 All four Moorhen chicks are out and about. 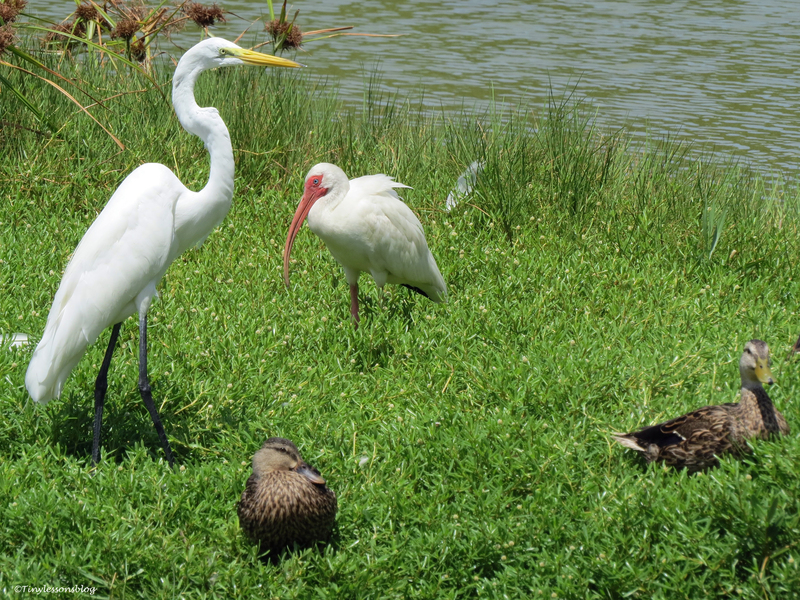 Great Egret, Ibis and two Mottled Ducks share a small islet. 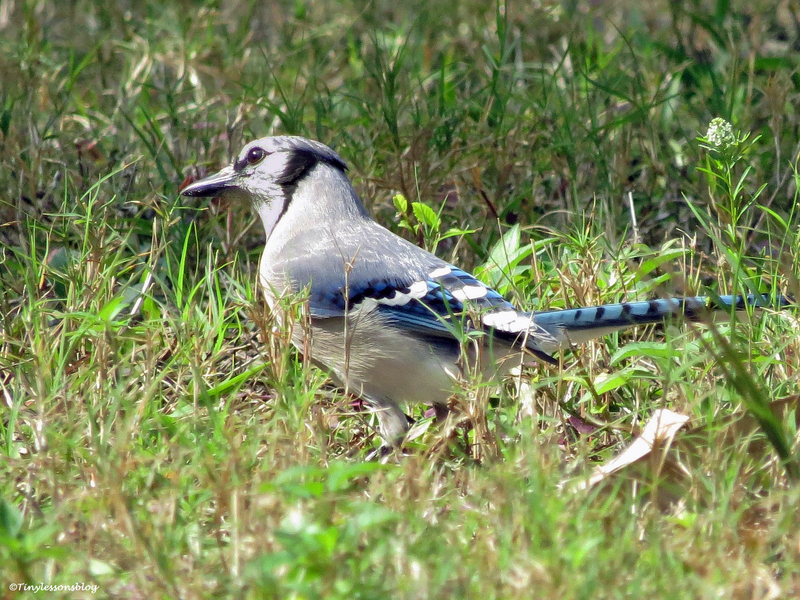 A Blue Jay forages in the grass. We all wish you a wonderful weekend. Peace. Timeout. Fresh Deliveries. 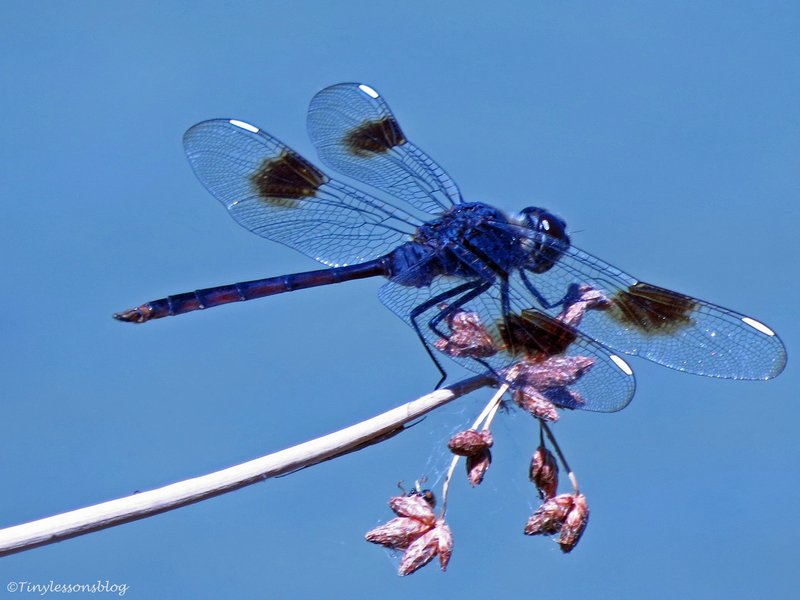 And Beauty in the Salt Marsh. Lunch time. 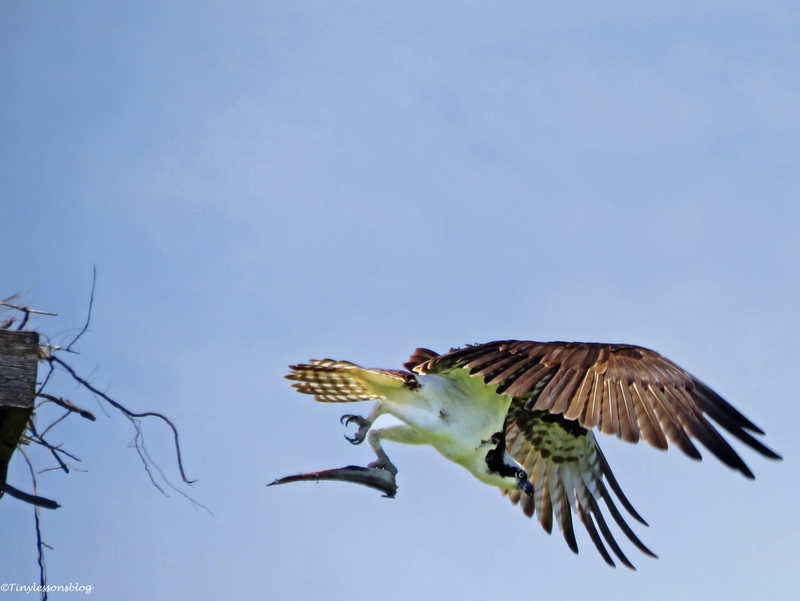 Papa Osprey is approaching the nest with a big fish. It wriggles in the air. Excitement skyrockets at the nest. Mama Sandy and the oldest chick lead the refrain singers. Fish, fish, fish! Shortly thereafter Papa Stanley lands with the fish. It’s still fighting for its freedom. The handover to Sandy is going to be tricky. If the fish falls onto the ground it’ll be uneatable. A teachable moment for the first born. 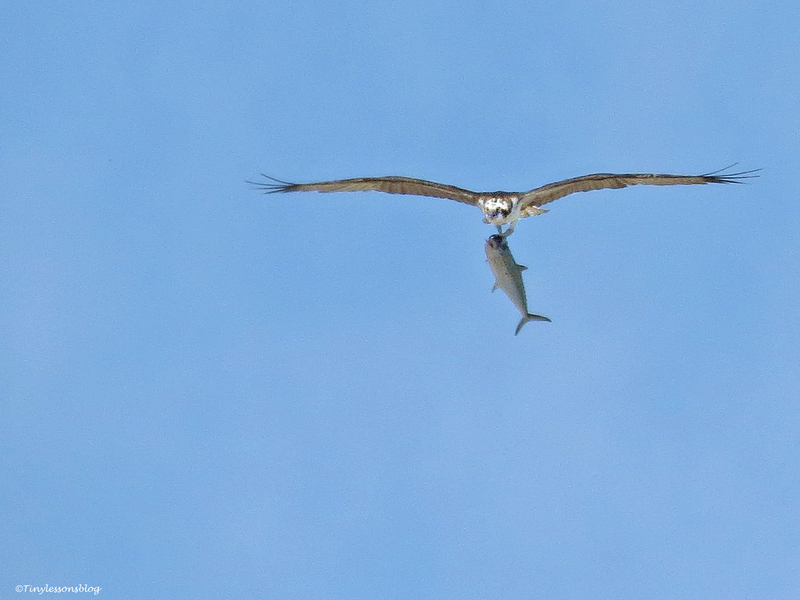 Sandy places her talons firmly on the fish. Stanley leaves immediately. Lunch delivery is complete. Sandy moves the fish several times. And finally parks it right next to the smallest chick. Like she always does. When are we gonna eat, Mama? The smallest chick is going to be fed first. But the big brother (yes, I think the oldest is a boy) doesn’t like that at all. He jumps onto his little sister’s (yes, I think it’s probably a girl) back and ruffles it up. That doesn’t go down well with Mama Sandy. 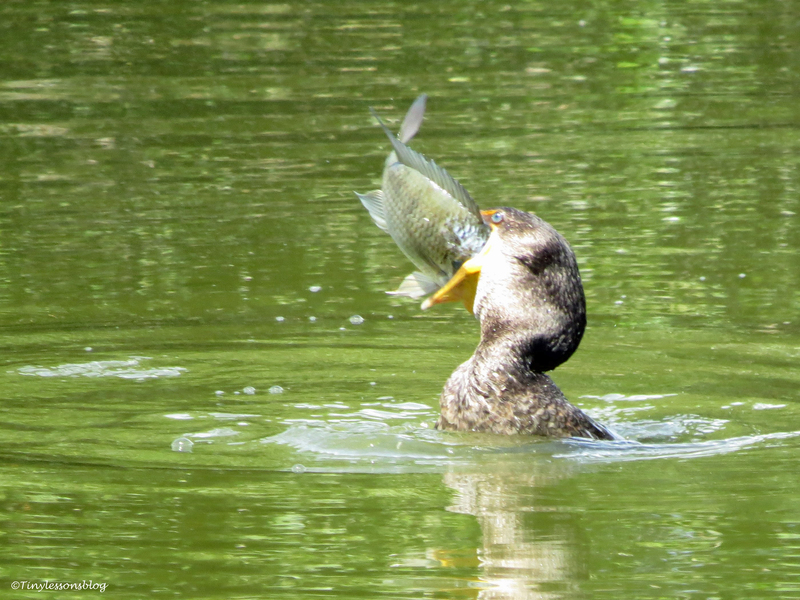 She calmly cleans up the fish, but doesn’t allow the badly behaving chick to touch it. Instead, the little sister gets the finest piece of fish fillet I’ve seen around here. All for herself. The little sister get a big fillet of fish. And a feather on her back is standing right up. Then she feeds the middle chick (probably a boy, not quite sure yet). And takes a few bites herself. And finally, after about 40 minutes, the first born gets to eat whatever is left. Talk about teaching manners to your kids. And it looks like the timeout in “quiet corner” did the trick. The middle chick gets fed next. Big brother still on timeout in the corner. Today I managed to wake up early and went for a longish walk at around sunrise. Pre-dawn on the bay side. It was quiet and peaceful around the salt marsh. Only me and the birds. Sunrise at the salt marsh. And there was lots of beauty to go around. I spotted many birds in the midst of getting their breakfast. Or just doing their morning meditation. 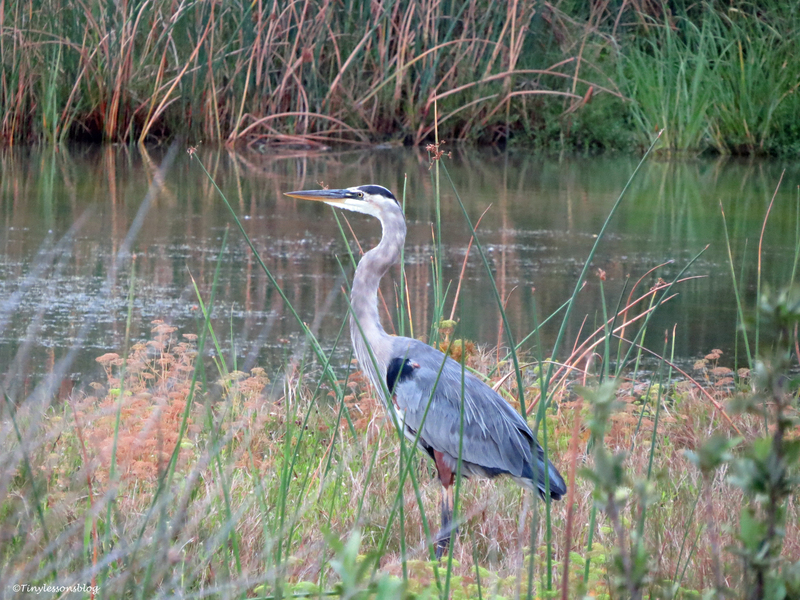 A Great Blue Heron doing his morning meditation…at the far end of the salt marsh. 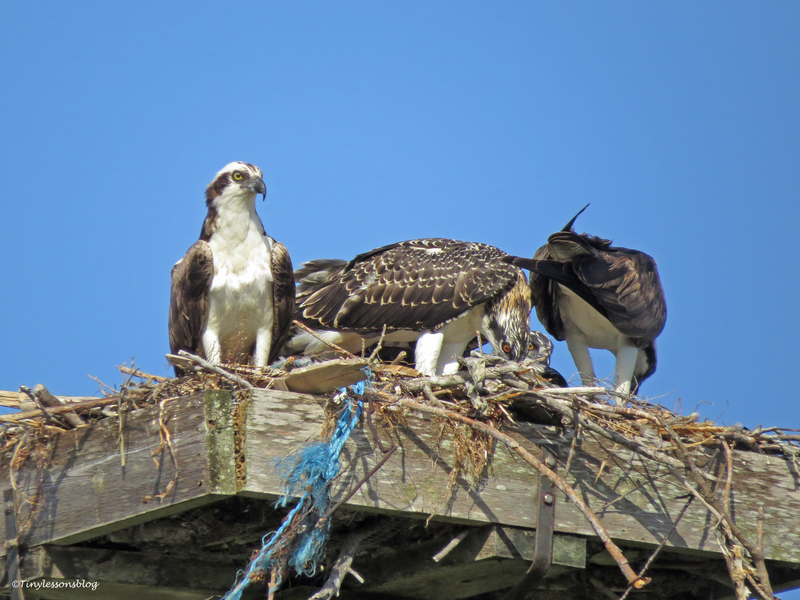 I thought (so little I know) that the Osprey family had already eaten breakfast. They seemed relaxed, so maybe Sandy had gotten them an appetizer much earlier in the morning. After saying hello to them I continued my walk. But suddenly sensed something was different. 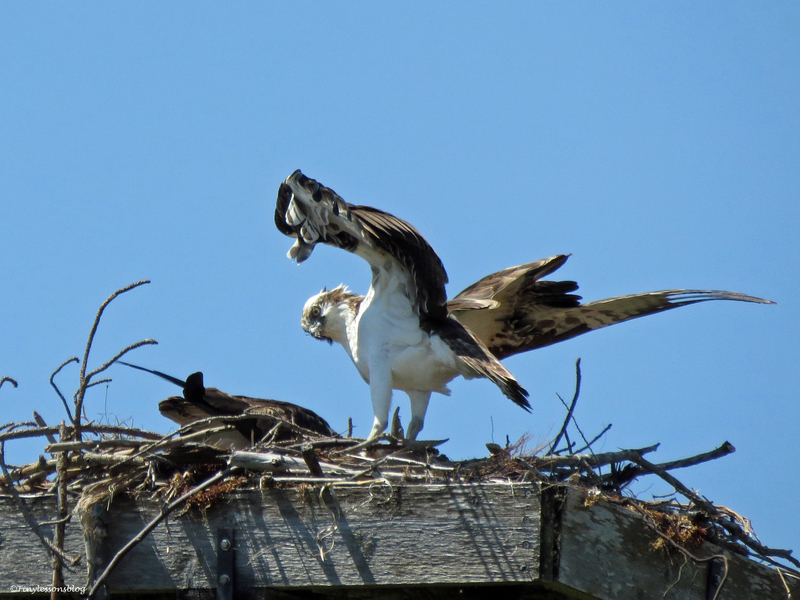 I looked back at the nest and saw Papa Stanley had arrived with a fish. 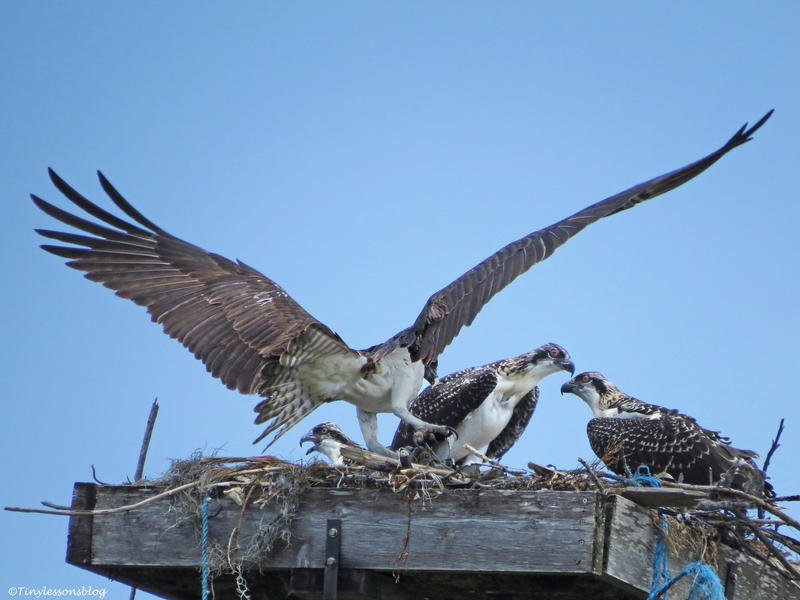 Breakfast was in full swing in the Osprey household. And for once Stanley had decided he’d stay for a while with his family. He talked to his kids, scanned the environment and then left after a few minutes. He flew towards the ocean. Maybe finally getting his own breakfast. I took a short one minute video clip one morning while the chicks were eating, and added the Moorhen taking his bath this morning. Be warned though, it’s truly clumsy as I’m definitely not a videographer. But I thought some of you might still enjoy seeing them “live”. You’ll notice that the oldest chick is still last in the line. 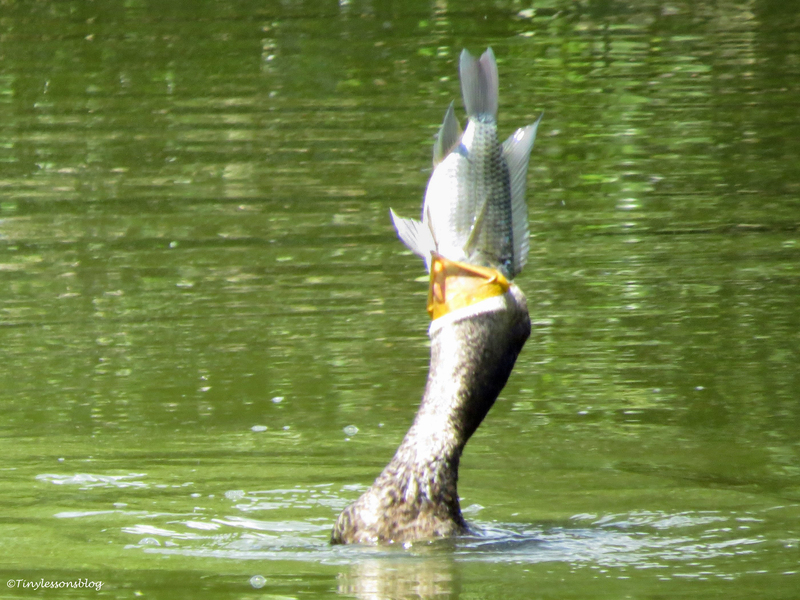 In the second take only his tail feathers are visible when the two others are fed by Sandy. But I have to say he took it with stride. Maybe he’s learned his lesson. I also think we need to name the chicks soon. Looking forward to some creative suggestions! The winner(s) will receive a prize. Bumble suggested his book, and I agreed. I walked home through the beach. It was still very quiet. 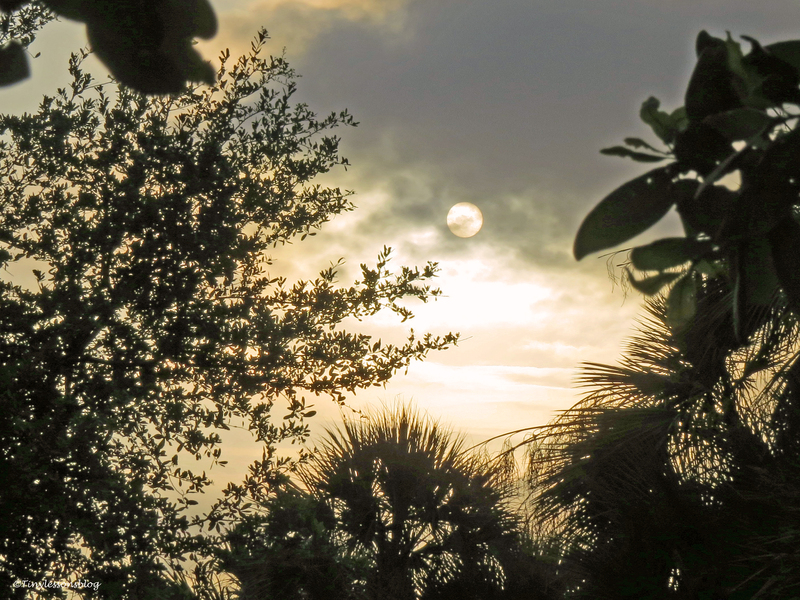 And very cloudy, to Florida standards, of course. Walking along the beach just after sunrise. That’s all for this week from the salt marsh. I wish you all a wonderful weekend and Happy Memorial Day to friends in the US. Be good now and travel safely. Parenting Preteens. Exercise Regimens. And More Babies in the Salt Marsh. 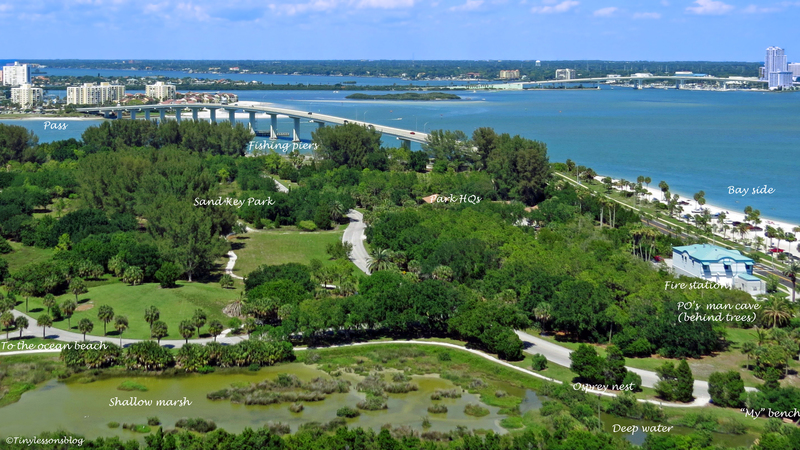 The bigger picture of the salt marsh ~ click to enlarge. 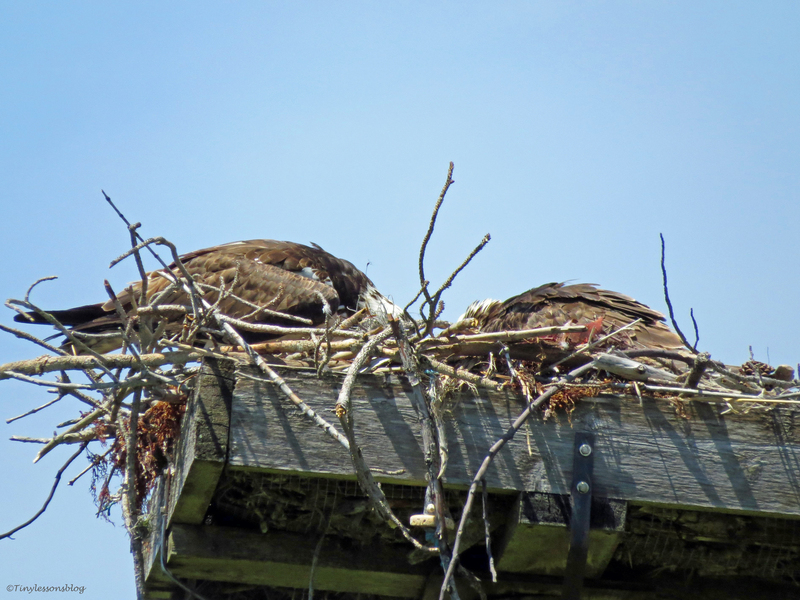 And while we are on the pictures I took last weekend, you can also see the nest from above. It’s getting somewhat crowded. 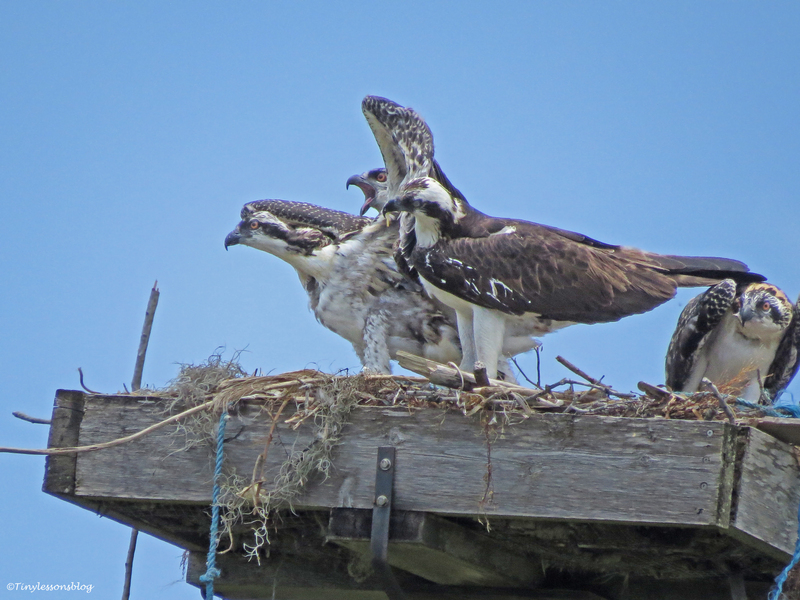 The Osprey family pictured from above. The chicks are growing fast. They resemble their parents more and more. I have to say I admire the parenting skills of this couple. 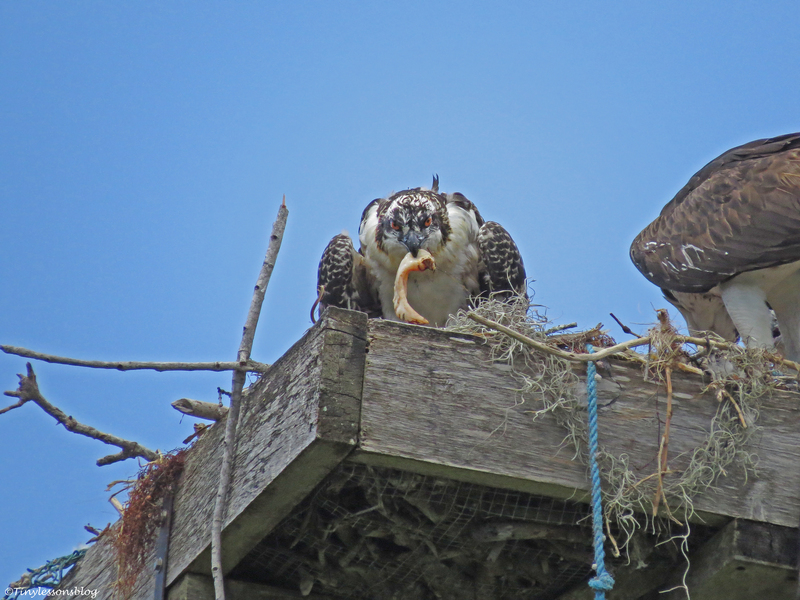 Sandy has protected the youngest chick and ensured s/he gets a fair share of the food. And she’s taught all three kids patience and great manners. There are no signs of the usual sibling rivalry, no fighting or picking on each other. Mama Sandy feeds the youngest chick at sunrise today. Papa Stanley must have made a pre-dawn fishing trip and is now taking a well deserved nap. 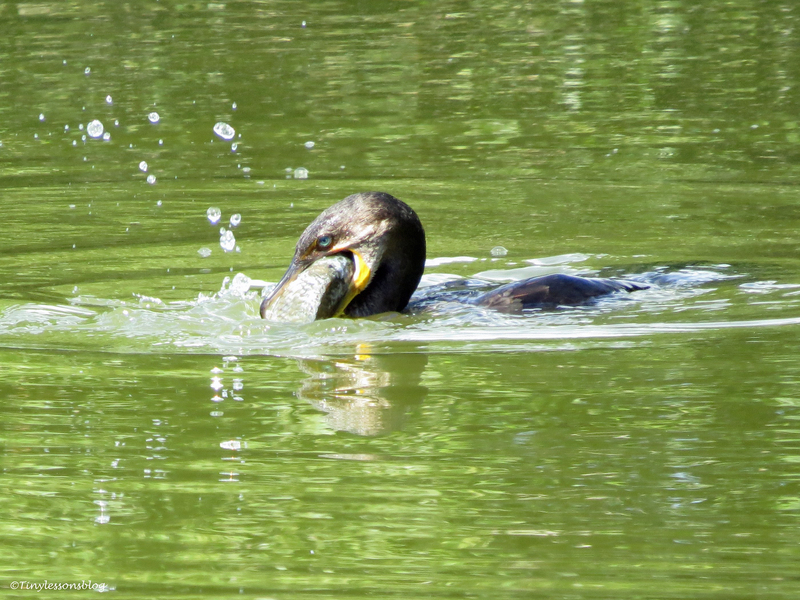 Stanley brings in fish after fish all day long and participates actively in the upbringing of their offspring. Like any modern dad. 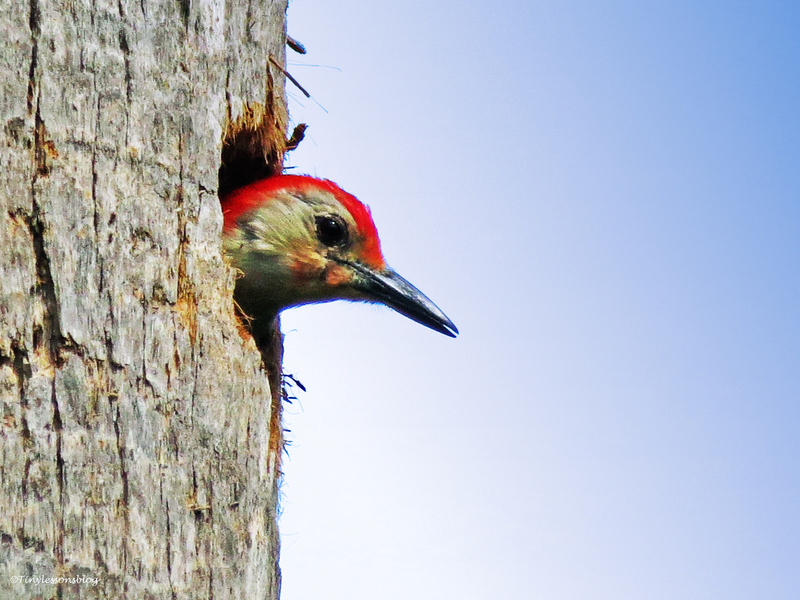 And both of them are highly skilled in protecting the nest, as you’ve seen. Stanley brings in a fish, head already eaten as usual. One day I witnessed a quiet discussion between the parents while the chicks were napping. Or more like a monologue by Sandy. Stanley didn’t say much. He was in the listening mode. I didn’t understand all of it, but it ended up by Sandy asking him to go fetch afternoon snacks. Sandy asks for afternoon snacks. Stanley obliged. He flew towards the ocean at exactly 2 p.m. And came back 17 minutes later with a shiny fish. Is that a record or what! He flew over the nest to show it to Sandy before taking it to his man cave for initial cleanup. Stanley flies towards the ocean and returns 17 minutes later with a fish. 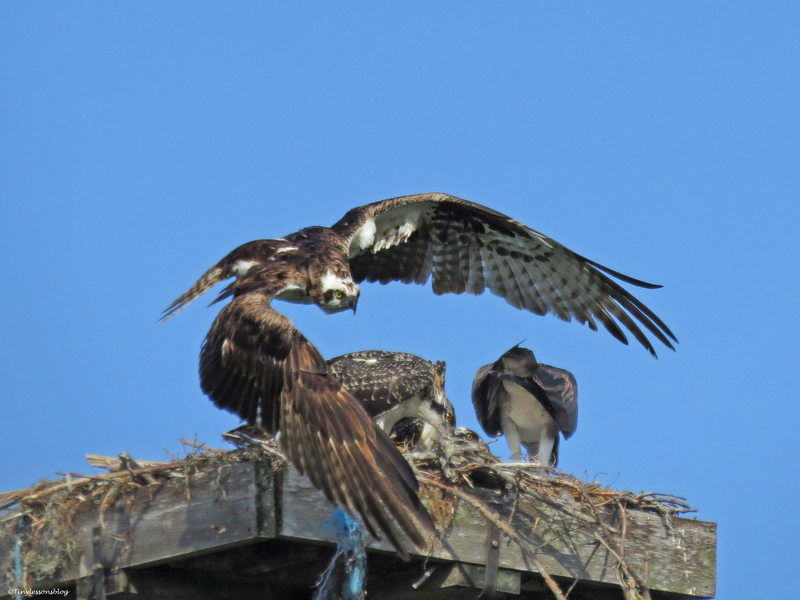 The first-born chick has already started “wingersizing”. 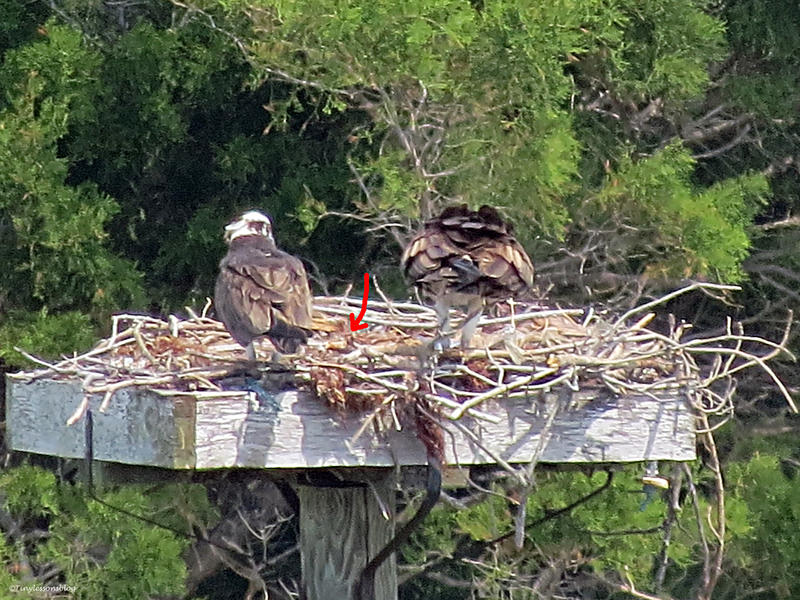 That means s/he may fledge within 10-14 days. The middle chick will not be far behind, and the youngest probably a few days after that. I made a short gif image for you to see how it’s done (sorry for the camera movement, I don’t usually carry my tripod on these short walks). First born chick exercises his/her wings by Tiny (click to see the exercise, repeats only three times). 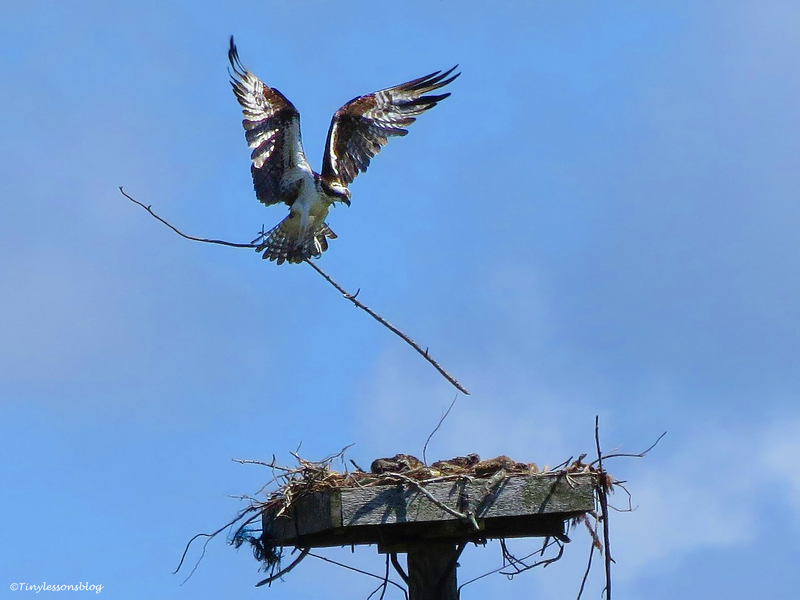 Sandy now also leaves the nest a bit more often, but only for a minute or two, to bring in some reinforcements to the nest. Note how flat the chicks are lying in the nest while she’s gone. Sandy brings in additional railing materials. Luckily there hasn’t been any drama to witness this week. But I have some good news. 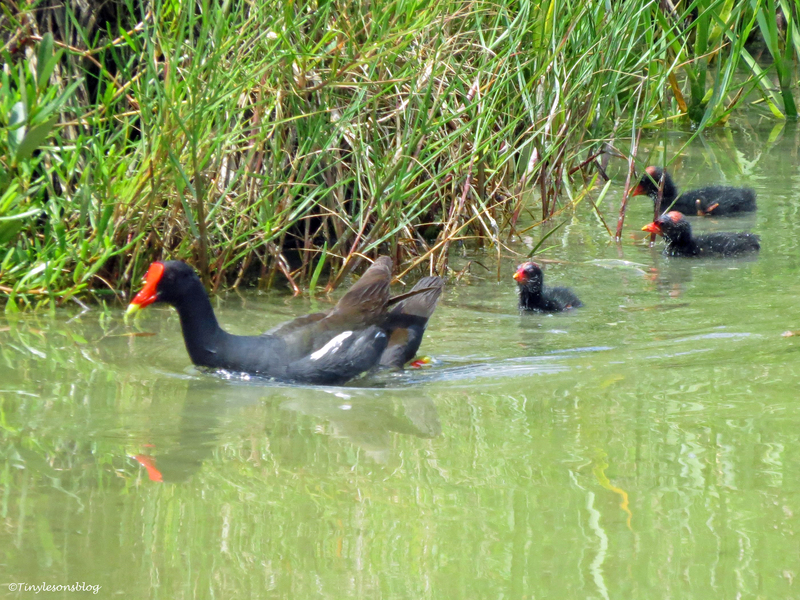 In addition to the ten ducklings, there are three tiny Moorhen chicks in the salt marsh! 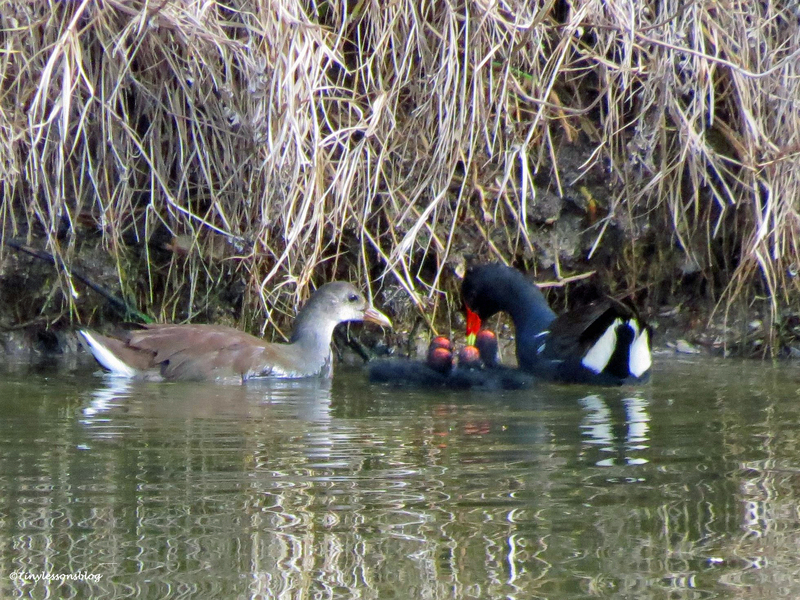 I spotted them on a swim with Mrs. Moorhen yesterday. Mrs. Moorhen with her three chicks. Help! Where are you mommy? They are tiny black fluff balls with red markings and really big feet. One of these days I hope to spot them walking in the grass so you can see for yourself. 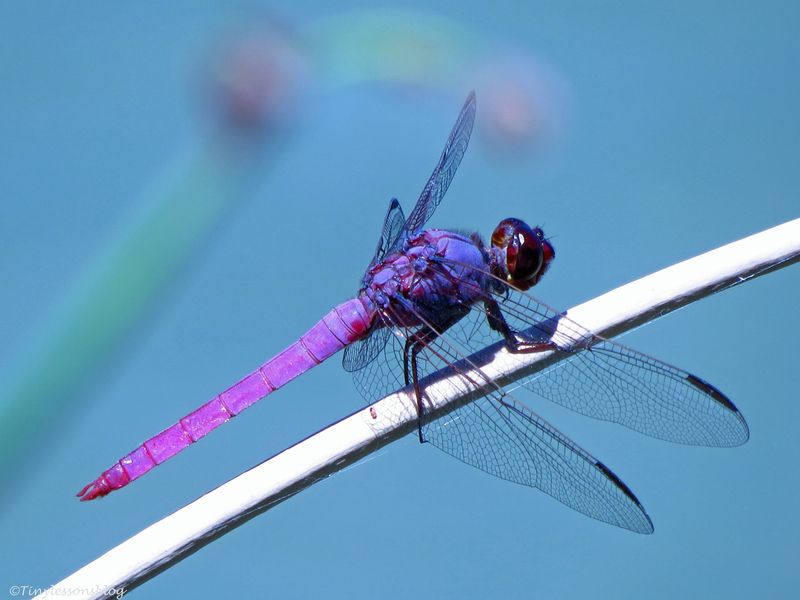 I’ve also tried to see if I could find the ten ducklings again, but instead of them coming out, I spotted these two dragonflies enjoying the sunshine just above their nest. The other day I also saw something funny I think you might enjoy. A juvenile Great Egret was exercising with a Mottled Duck. One, two, three, four. Repeat. This routine attracted another duck onto the scene. Perhaps also wanting to participate. Young Great Egret exercising with a Mottled Duck (click to see the exercise, repeats only three times). Fireworks. Strong Storms. And Little Miracles in the Salt Marsh. The sky lit up, and loud bangs reverberated through the salt marsh. 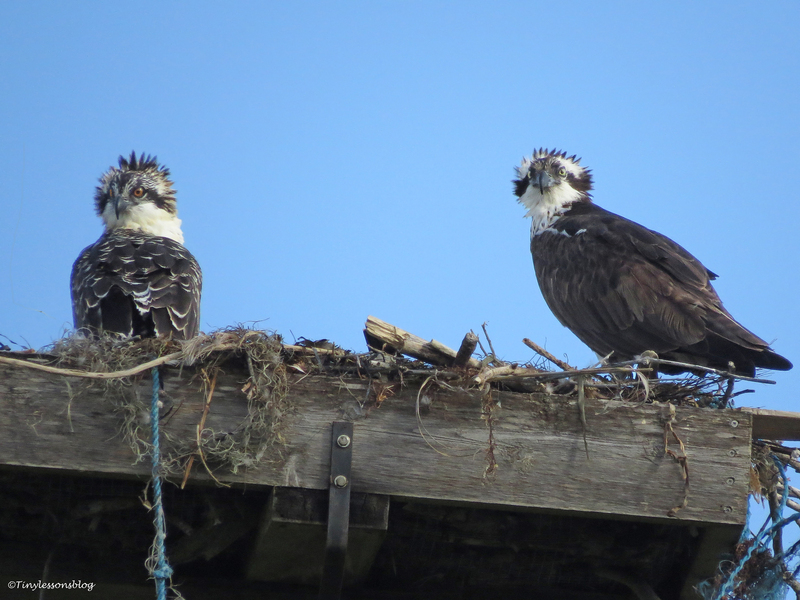 About an hour after bed time, the three Osprey chicks woke up to experience their first fireworks. Courtesy of the Sugar Sand Festival going on just north of the park, on the other side of the narrow waterway. Luckily Mama Sandy and Papa Stanley have experienced these occasional “disturbances” several times before. I’m confident they made the chicks feel safe. And explained to them the silly fascination with these loud nightly displays we humans have. Lights come on with a bang in the middle of the night. On Sunday afternoon the drama continued, but this time it wasn’t manmade. Papa Stanley had just left for his 2 p.m. fishing trip on the bay when the thunderstorms rolled in. The skies darkened instantly. The winds picked up, gusting up to 50 miles/hour. Dry leaves and small branches swirled through the air. Sheets of rain moved sideways like grey walls of water, followed by thunder and lightning. 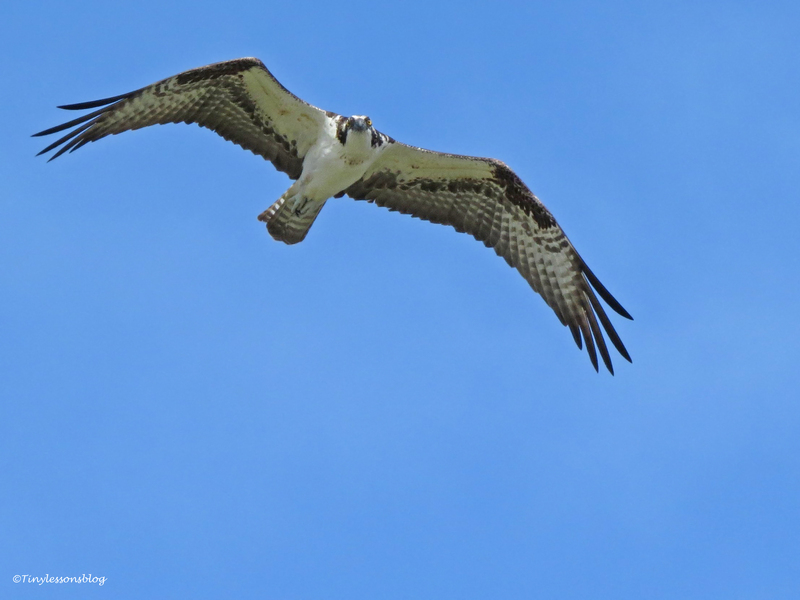 Storms over the bay where Papa Osprey went to get some afternoon snacks. 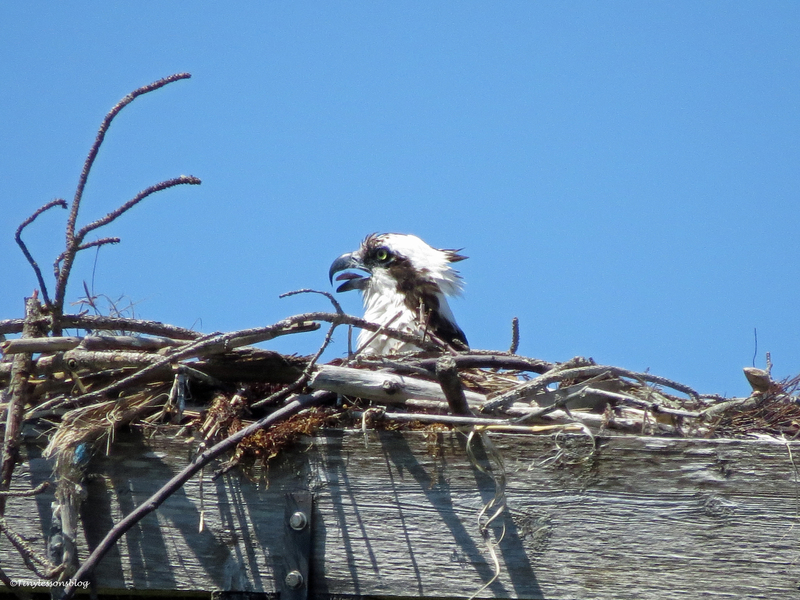 Mama Osprey was tightly pressed over her chicks, her head pointed against the wind. 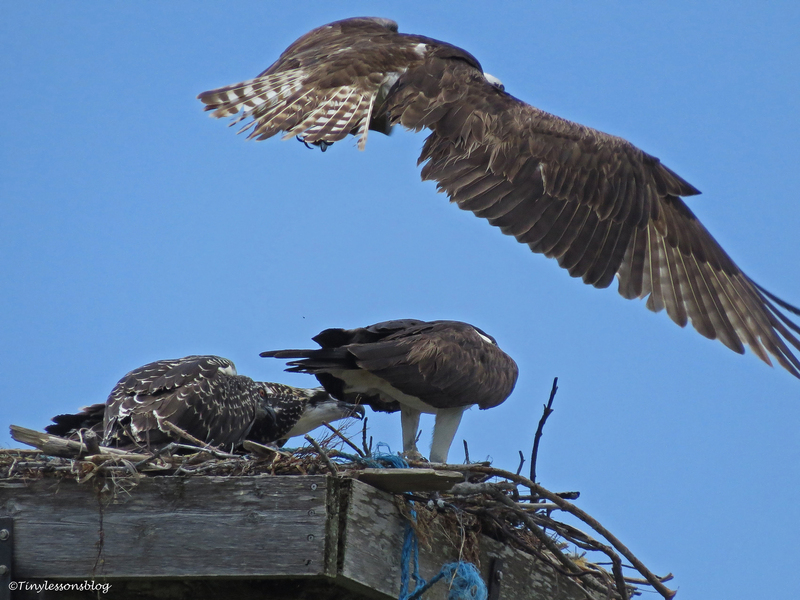 The chicks experienced their first torrential rains and their first thunderstorms under Mama’s half-spread wings. Mama Sandy protects the kids during the thunderstorms – as seen from my terrace. This scene was repeated, with more intensity, on Monday afternoon. Looking through my window with binoculars, I could see that both Sandy and Stanley were in the nest shielding the kids from wind and rain. 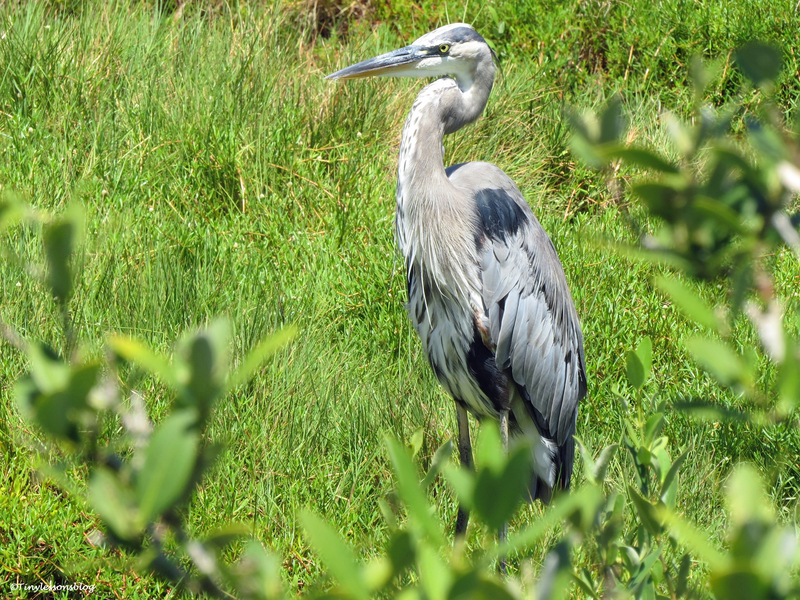 On Tuesday afternoon I could finally take a walk to check on the residents in the salt marsh. 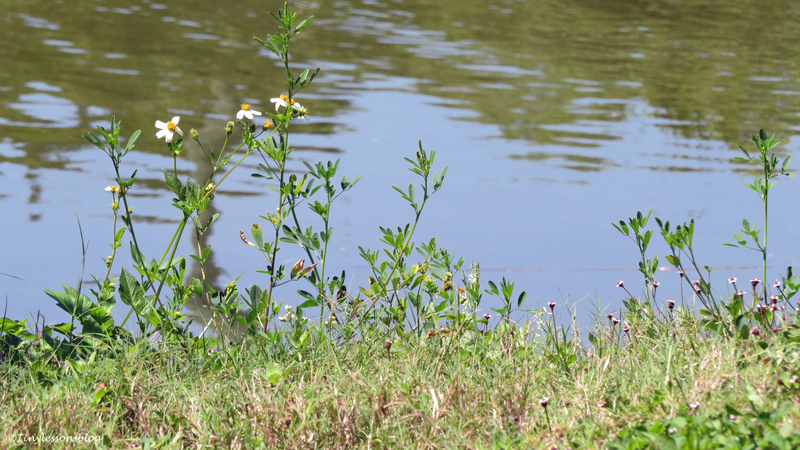 The water levels were up throughout, and I saw several feathery friends out inspecting their surroundings after the storms…or just enjoying the much nicer fishing weather. Mr. Moorhen inspects his flooded neighborhood after the storms. 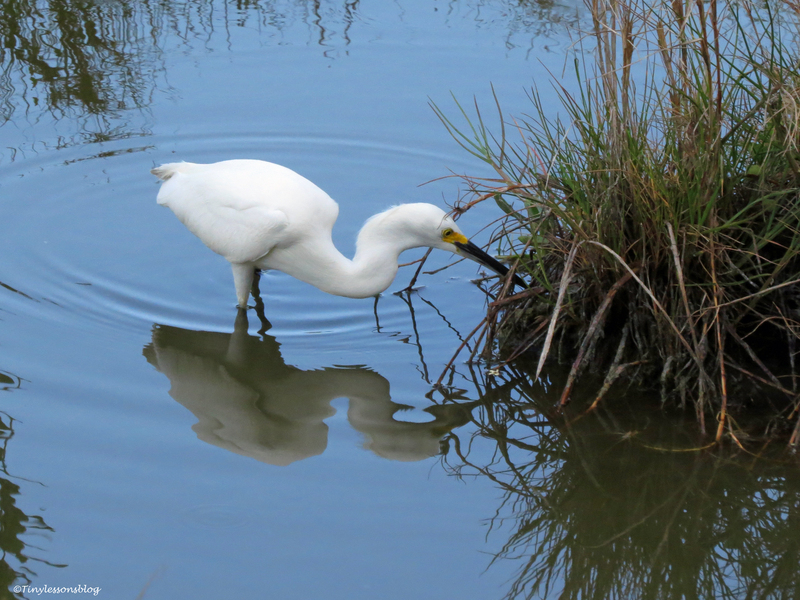 The Great Egret goes fishing after the storms. 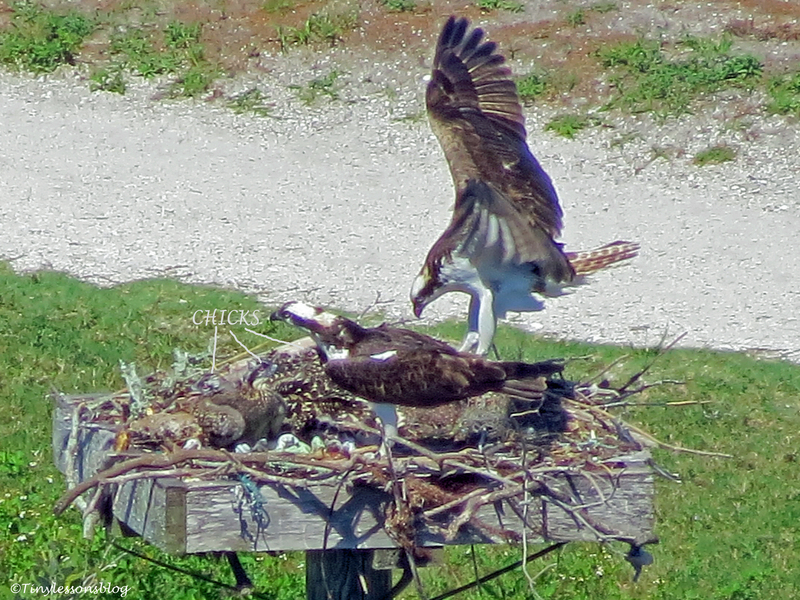 Arriving at the osprey nest I noticed Mama Sandy had a small injury on her tummy, a bloody patch just above her left leg. 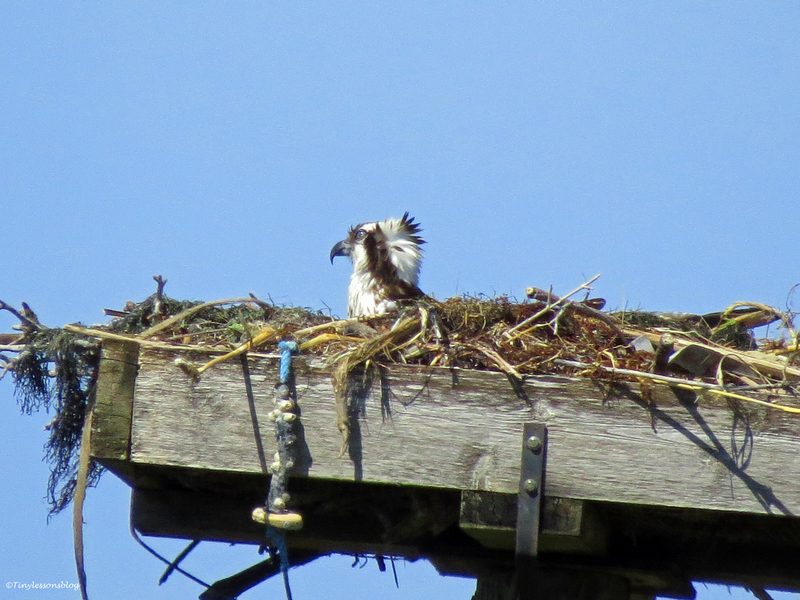 But she was in full swing feeding the chicks, and didn’t seem bothered by it. Something must have hit her there scraping away the soft feathers and skin. 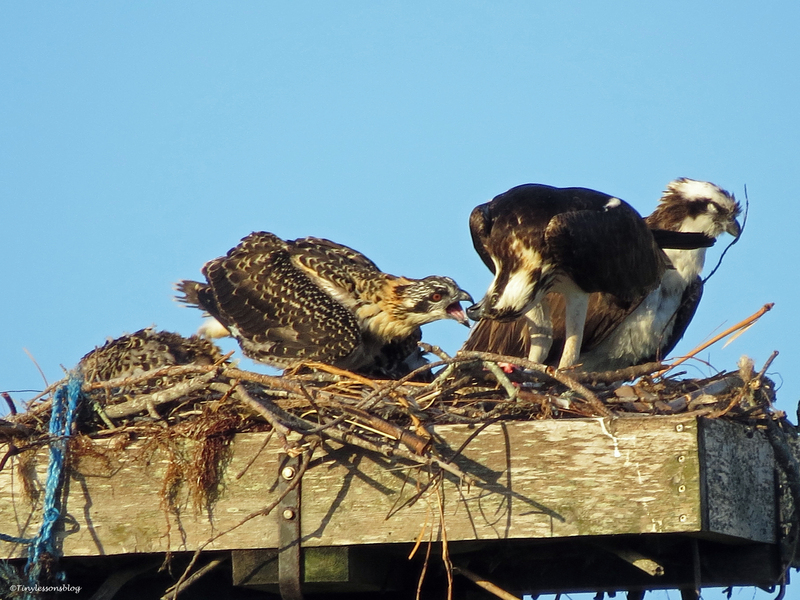 The first born chick watches Mama Sandy feed the middle chick while Papa Stanley takes a nap. 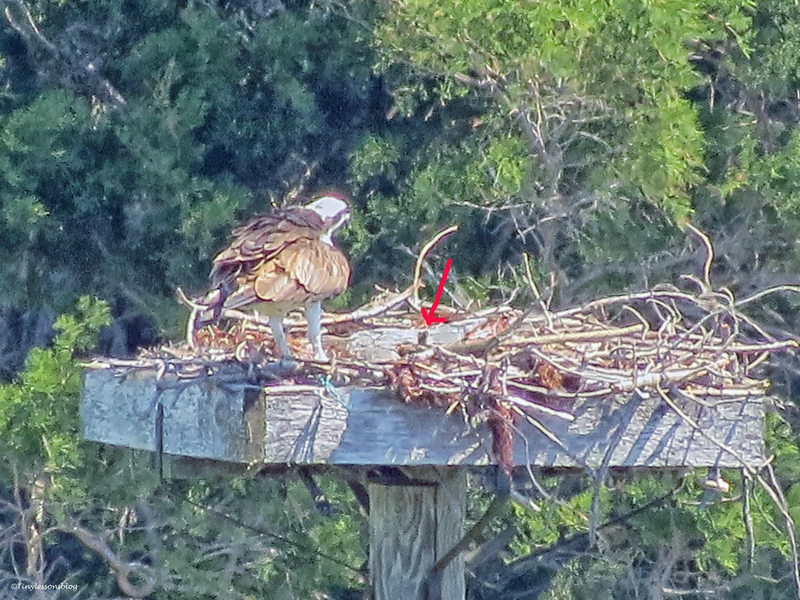 Mama’s injury is partly visible just above and left of the nest corner. 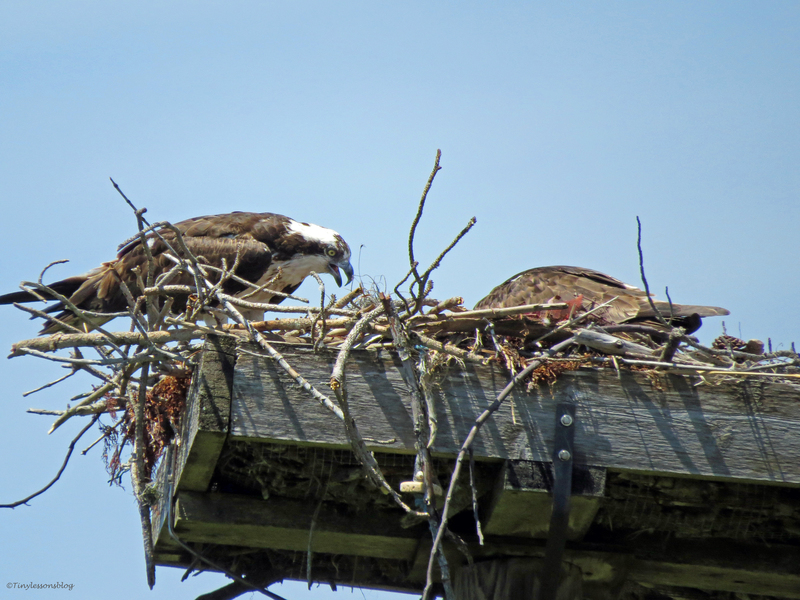 It’s been quite a week for the Osprey family. The first born chick is now about four weeks old. All three chicks have learned to walk and discovered their wings. Their curiosity is limitless. They come close to the edge to scan the skies or to peek down. Even just to say hello. The middle chick says hello to Tiny. Their eyes are almost red at birth, then turn to a lighter orange shade and finally yellow at maturity. So what do good parents do? They go shopping for baby gates. That’s exactly what both Sandy and Stanley have done several times this week. 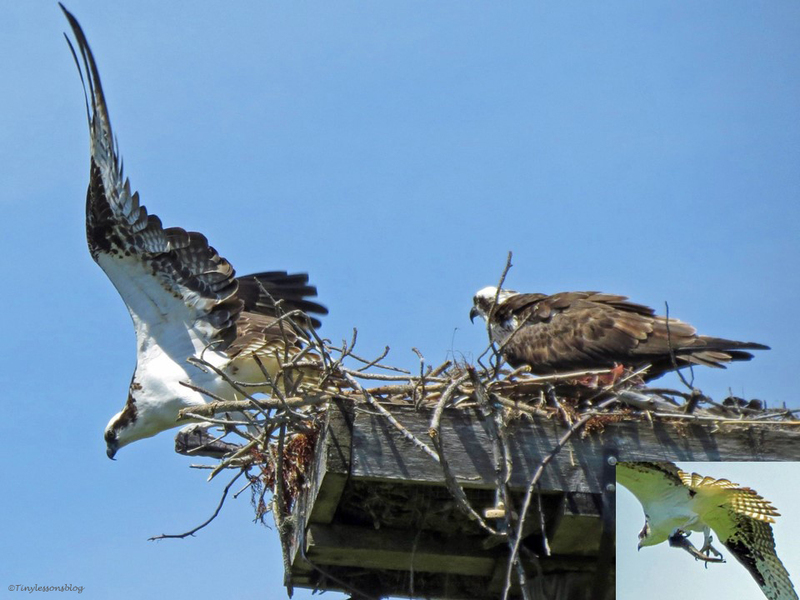 Mama Sandy brings in reinforcements to the nest. She left the first born (on the left) in charge. Papa Stanley brought in a heavy duty baby gate. A family portrait (almost). The smallest chick is being fed by Mama Sandy, his/her head partly visible next to Mama’s leg behind the middle chick. Wake up time just around dawn at 7 a.m.
Breakfast 7:30 – 8:30 a.m. Lunch 11:30 a.m. – 12:30 p.m. Afternoon snack 3:00 – 4:00 p.m.
Dinner 7:00 – 8:00 p.m. Sleepy time just around nightfall at 8:00 p.m.
Nice, eh? I don’t think these wise parents have googled expert recommendations on consistency in meal and nap times. They just intuitively know. And that’s quite amazing to watch. In fact, it’s a privilege. Papa Stanley and the oldest chick scan the skies. Now is also the time to meet other youngsters. Yesterday afternoon I spotted a young Great Egret enjoying a refreshing bath at the shallow end of the marsh. A young Great Egret takes a cooling bath. 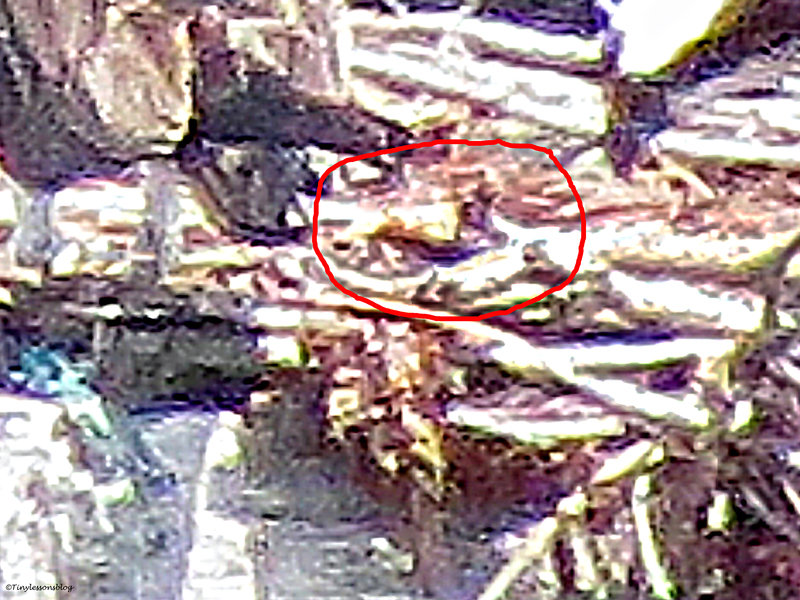 And watched quietly in awe when Mama Mottled Duck suddenly came out of her nest. With ten little miracles in tow. Possibly for one of their first swims. 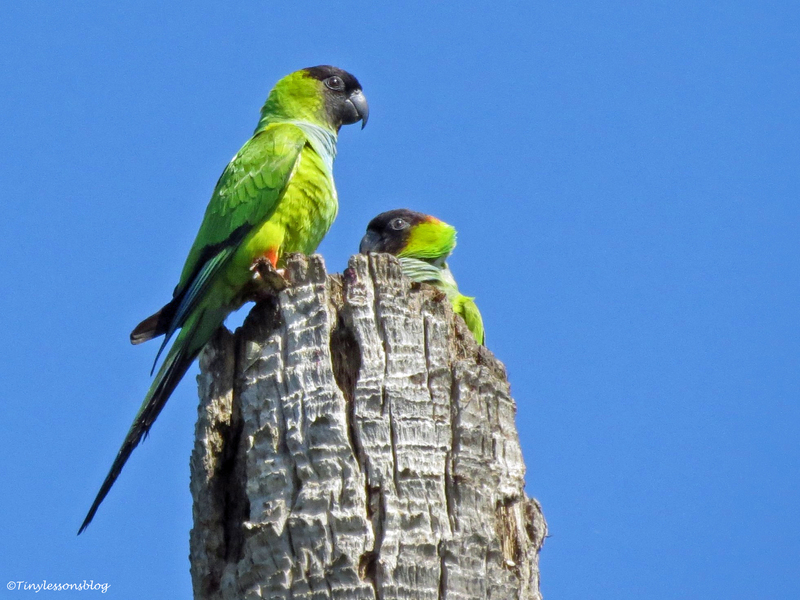 I could only see them for a minute or so before Mama took them into safety in a narrow corridor under the mangroves. Aren’t they lovely? Mama Duck takes her ten chicks for a swim. Mister Reddish Egret chases away the Great Egret. This morning it’s been raining on and off. I noticed that Mama Sandy left her kids by themselves for a little while. Probably to get more reinforcements to the nest. Right after she left it started raining again. 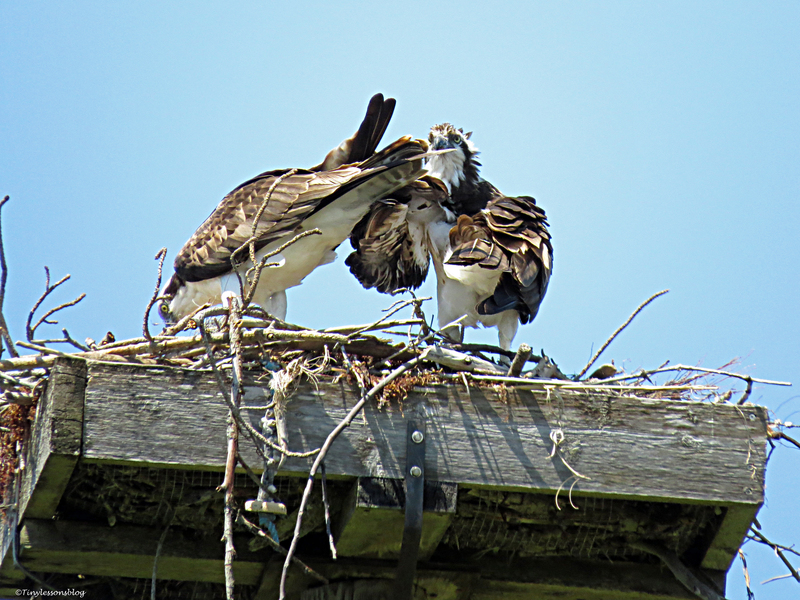 The three chicks moved to the middle of the nest and huddled together until she returned a few minutes later. 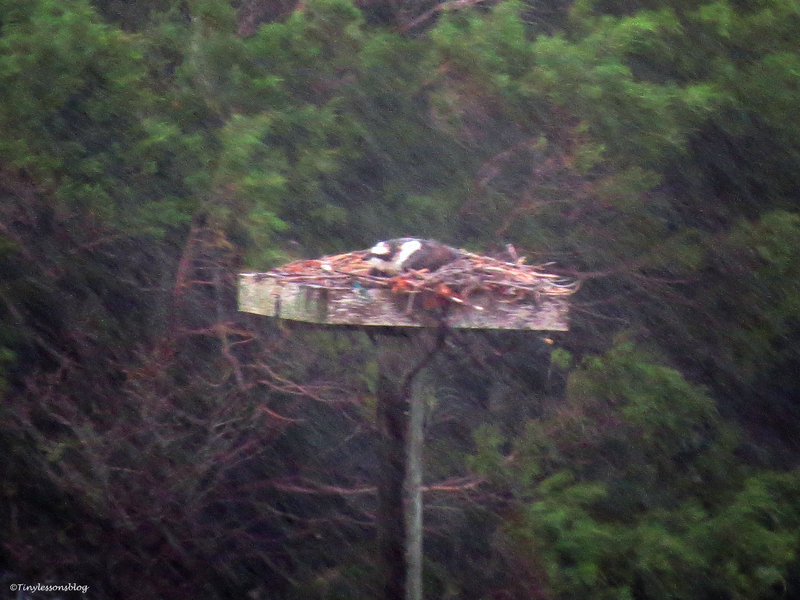 All three chicks huddling together in the rain. 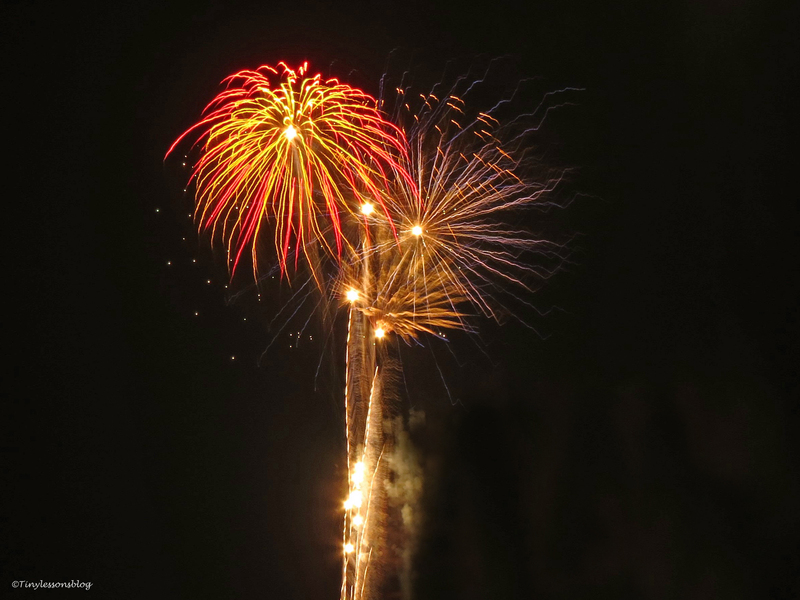 Sorry for the quality as I took this picture without a tripod from my terrace more than a block away. You will notice the youngest chick is quite a bit smaller than the other two. My guess is that the first two hatched a day apart, but the last born hatched 2-3 days after the middle chick. Sandy seems to keep him/her separate from the others, often between or right behind her legs when she’s in the nest, including at feeding time. I’m sure she does that to increase his/her chances to make it. Parents Shield the Newborn from Paparazzi. And Other Late Breaking News from the Salt Marsh. It’s really hard to be a paparazzo. 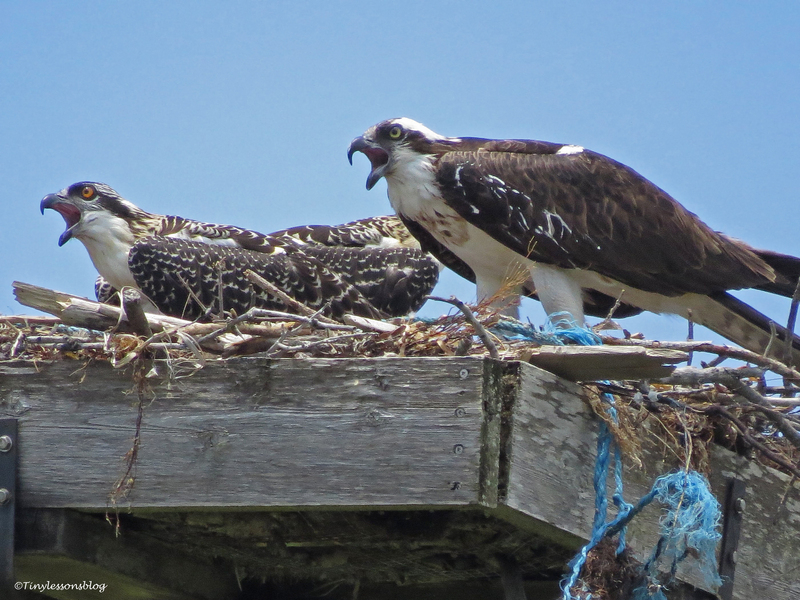 While some “duckies” are happy to be photographed, and even pose for the camera with their kids at times, that’s not the case with the Osprey family. The happy parents announced their baby news when I returned from my travels earlier this week. My guess is the baby was born between Thursday and Saturday last week. 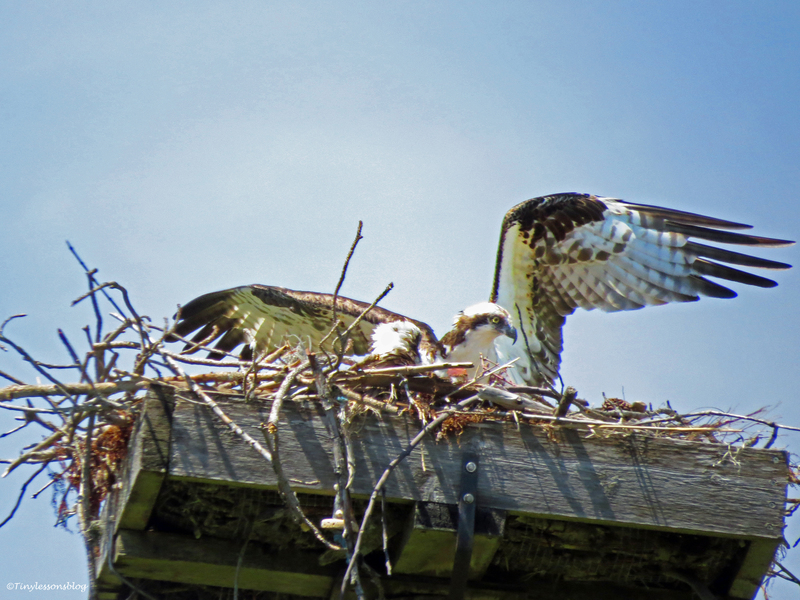 I could see both parents bent over the depression in the nest tending to the baby. But all my attempts to get a picture of the tiny hatchling have been thwarted by the protective parents. Almost. Baby food transport has arrived and feeding started. I have leaned far out over my terrace railings trying to get a clear line of sight into the nest, or a better angle. That’s not a totally risk free undertaking when your terrace is on the 14th floor and you’re trying to hold a 200x/1200mm zoom steady. 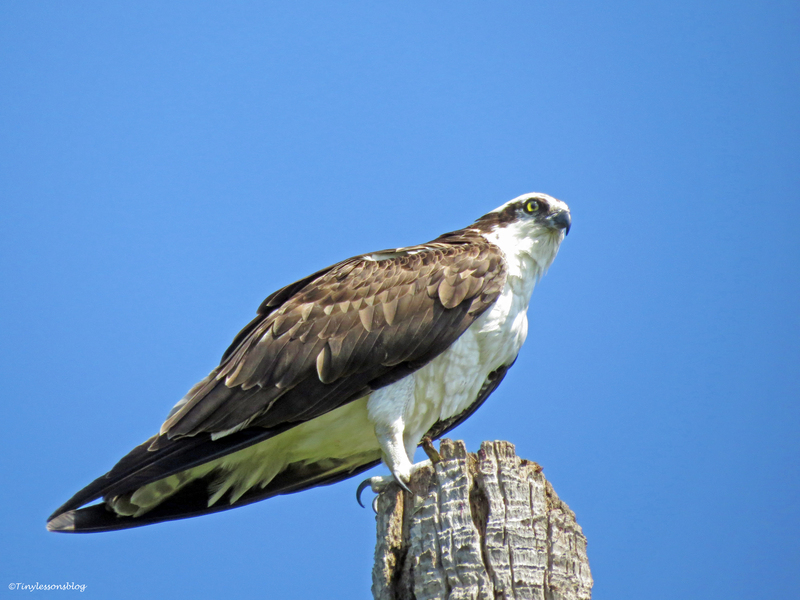 When visiting the salt marsh, I’ve have climbed up on benches closest to the nest. And even considered using stilts or climbing a tree. But despite my best paparazzi tricks, the only picture that I might have of the baby is below. I’m not sure if it’s the hatching, it could be wishful thinking. What do you think? The parents have now built a bit higher baby fence on the side facing my terrace so picture taking will be even more challenging. Good for the baby, bad for the paparazzo. I’ve walked around the nest yesterday and today. And while I will not be able to see the little one from the ground for a few weeks, I’ve observed interesting parenting stuff. Check out this photo story. 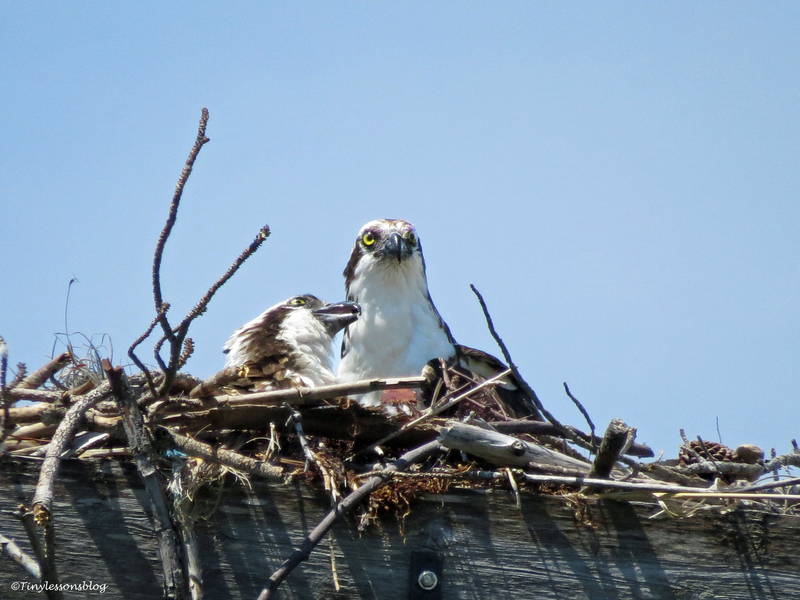 Mama Sandy broods the chick for the first 10 days…it’s quite warm and she’s getting sweaty. …until it’s his turn to feed the baby … under strict supervision by Sandy. When the baby has been fed it’s Sandy’s turn to have a bite, if she’s hungry. Finally Stanley flies away with the rest of the fish. I’ve seen this routine several times now. But I should add that Stanley is even more protective of the nest now. 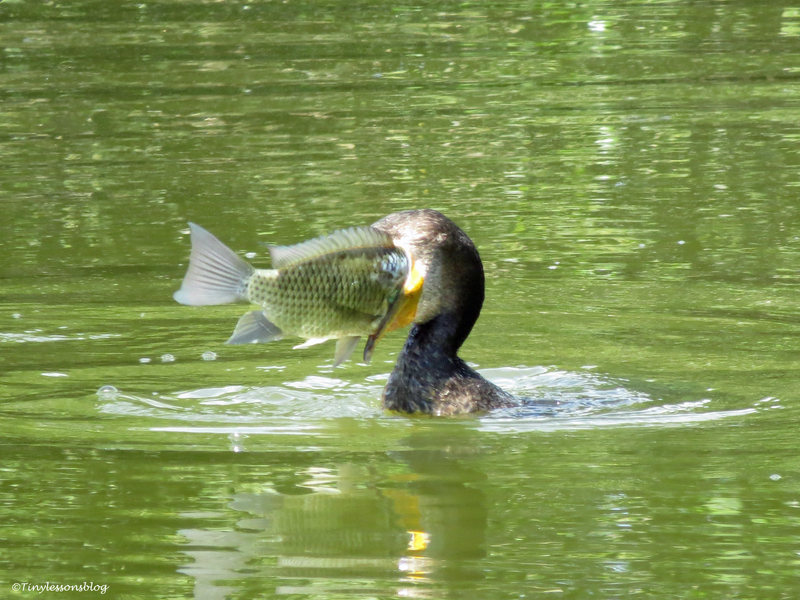 Yesterday I saw him fly away with his fish and return almost immediately. 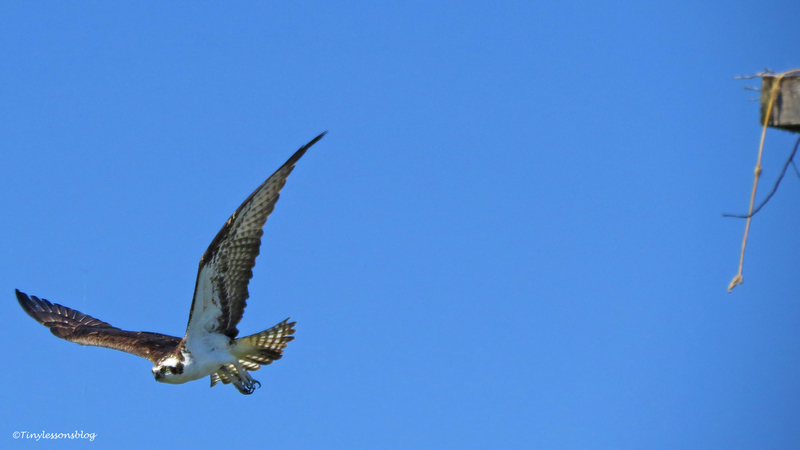 Osprey Steve was flying by and Sandy sounded an alarm. 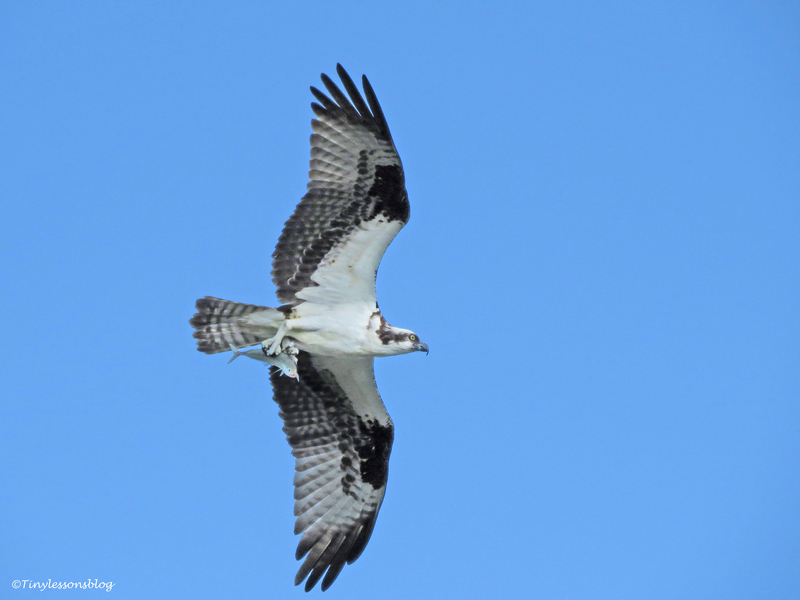 …who flies over the marsh. And only when everything is calm again will Stanley go to his man cave to finish his meal. Finally everything looks peaceful and Stanley leaves for his man cave again to finish his meal. I think Sandy and Stanley are amazing, doting parents. And I’m happy they are not alarmed when a clumsy paparazzo lurks around the nest. They are just not yet ready for a photo shoot with the baby. I get that. Later will do. When I was saying goodbye to Mama Sandy yesterday afternoon, I discovered a drama playing out in the deep water just below the nest. 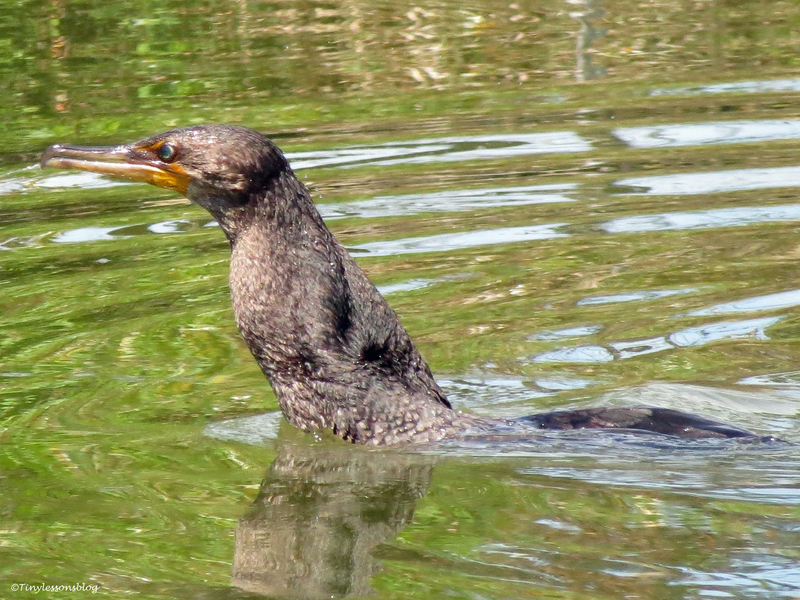 It was the Cormorant. Again. This is how it went down. The fish, I mean. …and it’s a big one! With some effort, slowly but surely. Such is life in the salt marsh. Never a dull moment in this beautiful place, where wildflowers greet the newborn. The little hatchling will learn all that in time. Bless his/her heart. Birthday flowers for the newborn. You can see the reflection of the nest pole in the water. 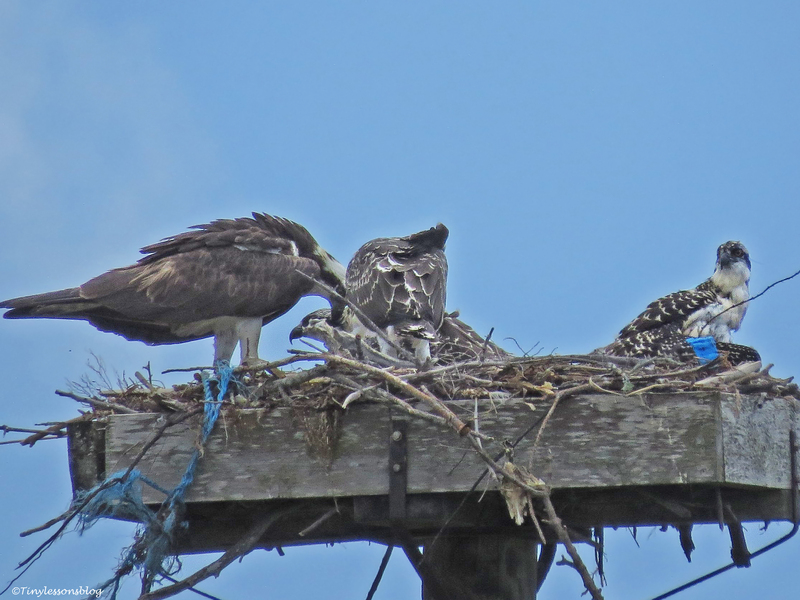 A tiny baby Osprey between Papa and Mama. Recalculating. Birds and Drones over the Salt Marsh. That brings me back to my calculations of the “due date”. I have now gone through my pictures from February. And I can say, with a high degree of certainty, that Sandy was incubating on February 21st. She may have laid the first egg on February 20-21. If that is correct, we would expect a hatchling anytime from this weekend to Monday-Tuesday next week. 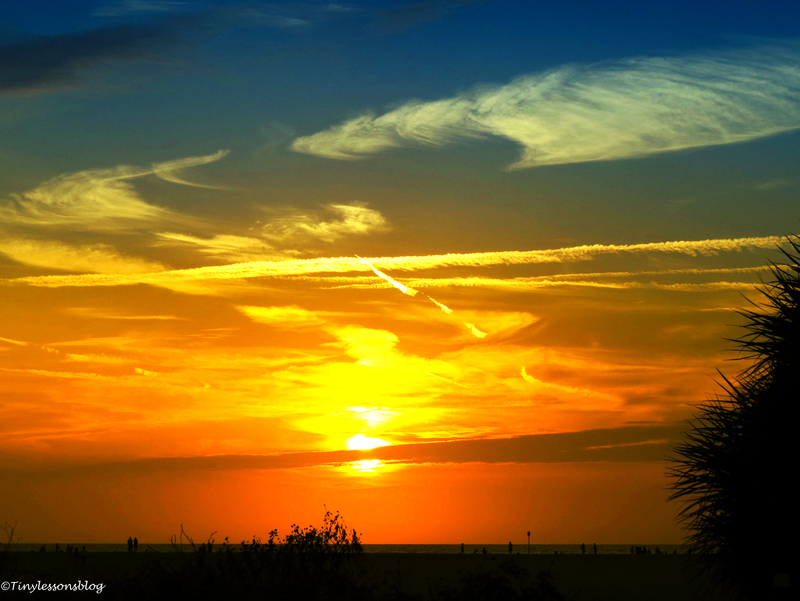 Last weekend I took a walk at sunset time. It was a beautiful evening. The salt marsh was quiet, most birds had already gone to their sleeping quarters. 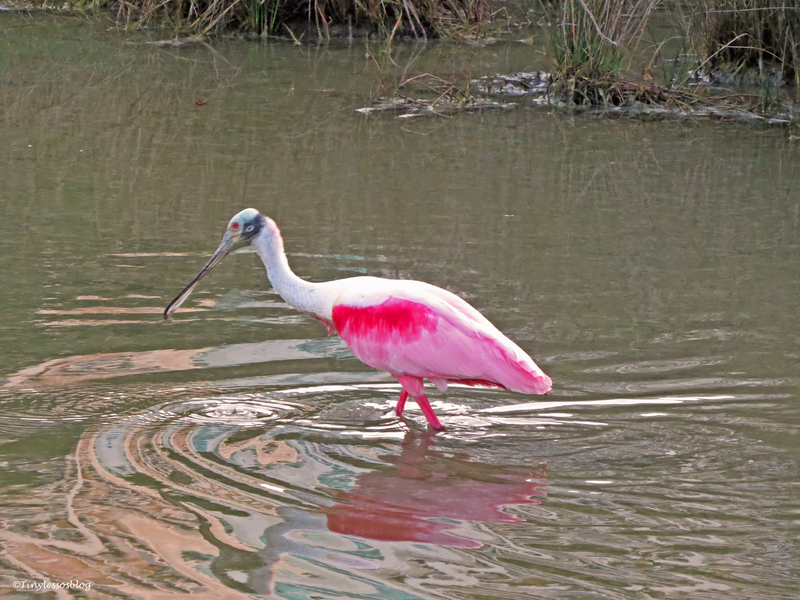 The only one still feeding in the shallow waters was a Roseate Spoonbill clad in hot pink breeding colors. 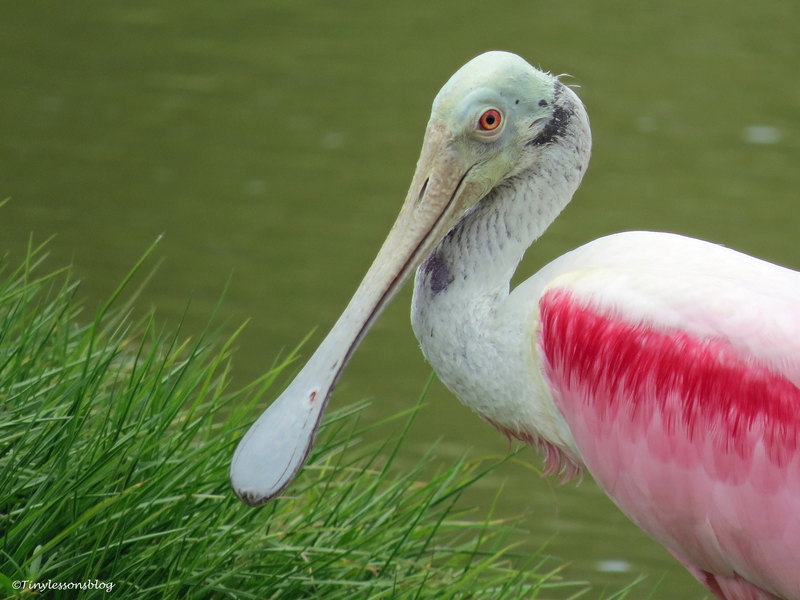 A Roseate Spoonbill looks for dinner. Mama Sandy had eaten her dinner and was sitting on the eggs. She raised her head to say hi. I didn’t see Papa Stanley. So I went looking for him. And found him in his man cave finishing dinner. 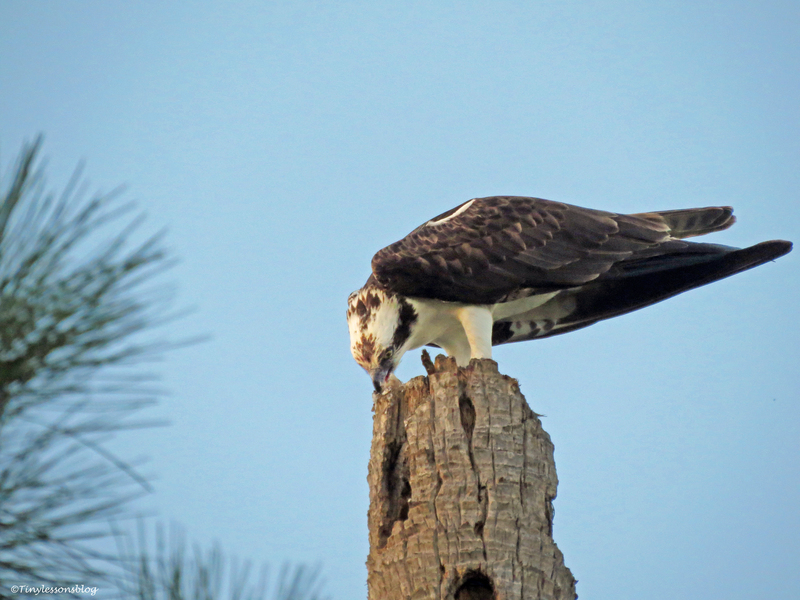 Mama Osprey sits on the egg(s) at sunset time…the sun no longer reaches the nest. 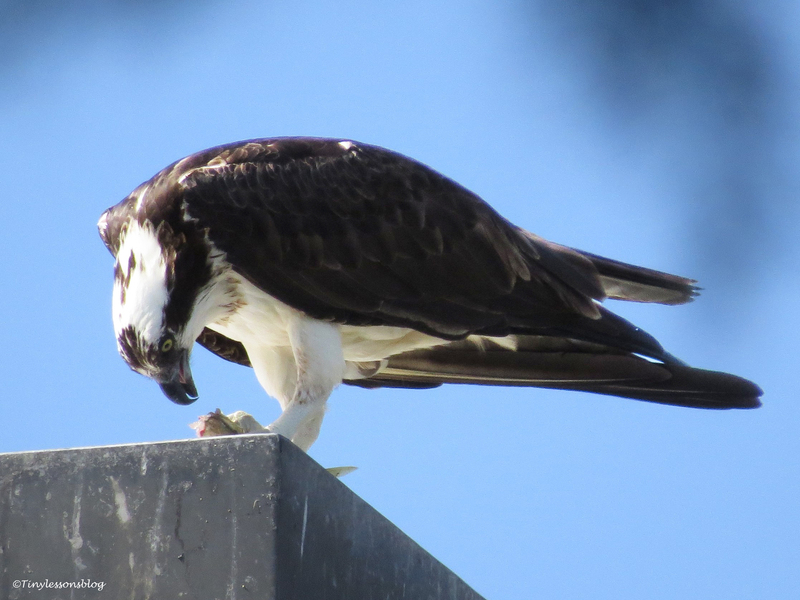 Papa Osprey finishes a meal in his still sunny man cave on the other side of the road. It was getting dark, and I had started my walk home, when I heard a faint humming sound. I looked up and saw a manmade bird, a drone, flying above the park. It was small, but I managed to get a photo when it turned and was lit up by the sunset’s afterglow. A drone flies over the park. From a distance I heard Sandy sound a short alarm. 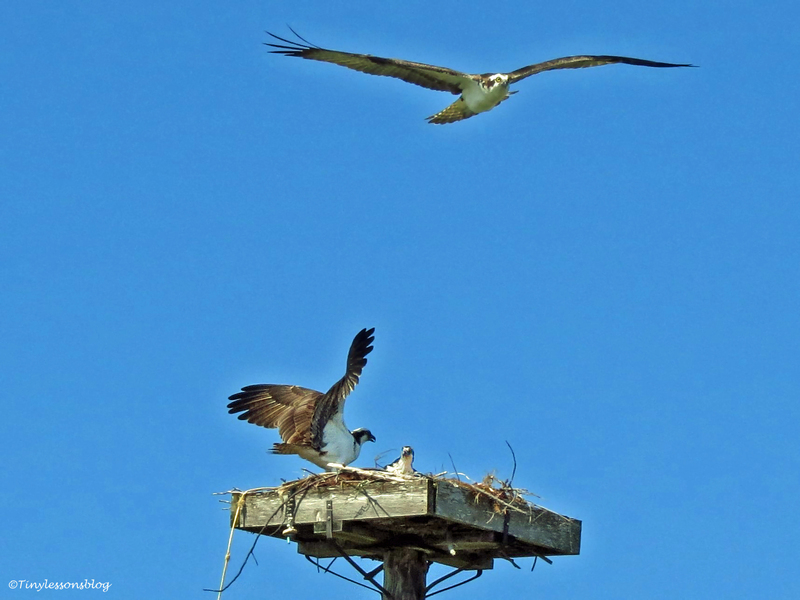 I’m sure Stanley flew right away over to the nest to protect her and the egg(s) from this unfamiliar danger. I’m assuming this was their first time to see such a strange “bird” fly in the skies over the marsh. It certainly was for me. And I can’t say I liked it. 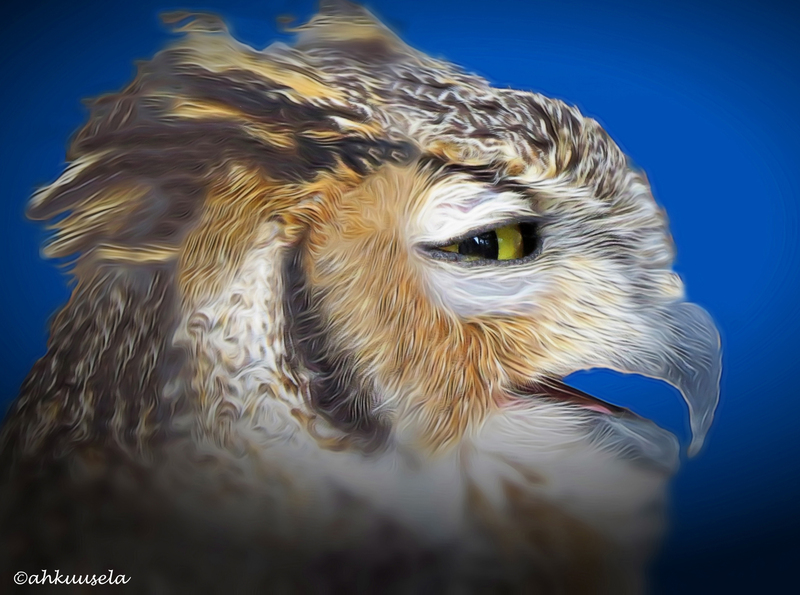 I definitely prefer birds made by nature. Like these little fellows. 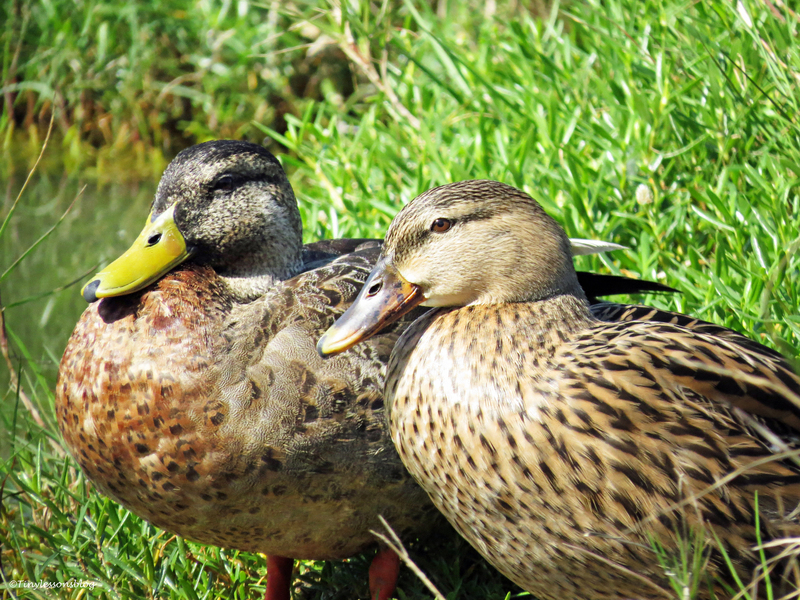 A Mottled Duck couple basking in the midday sun. The beginning of the week was peaceful. Lots of birds in the marsh. 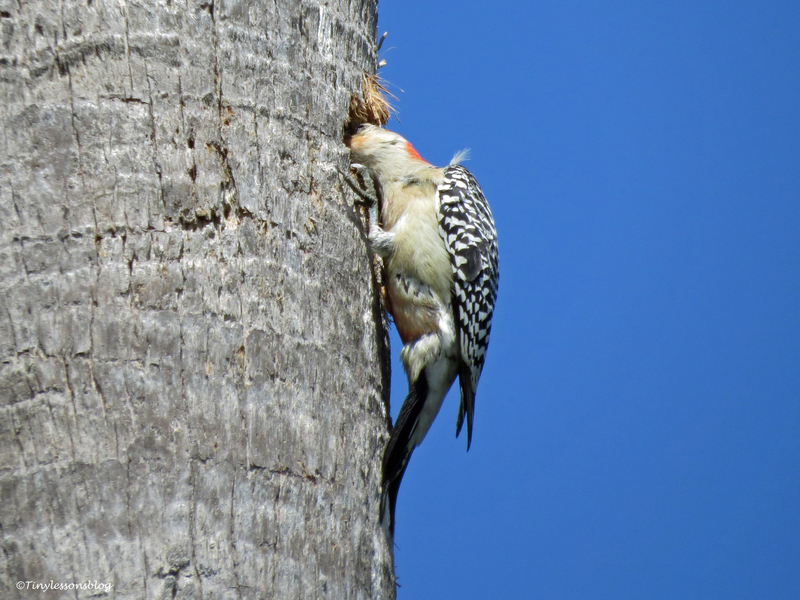 Many of them pairing up and working on their nests. 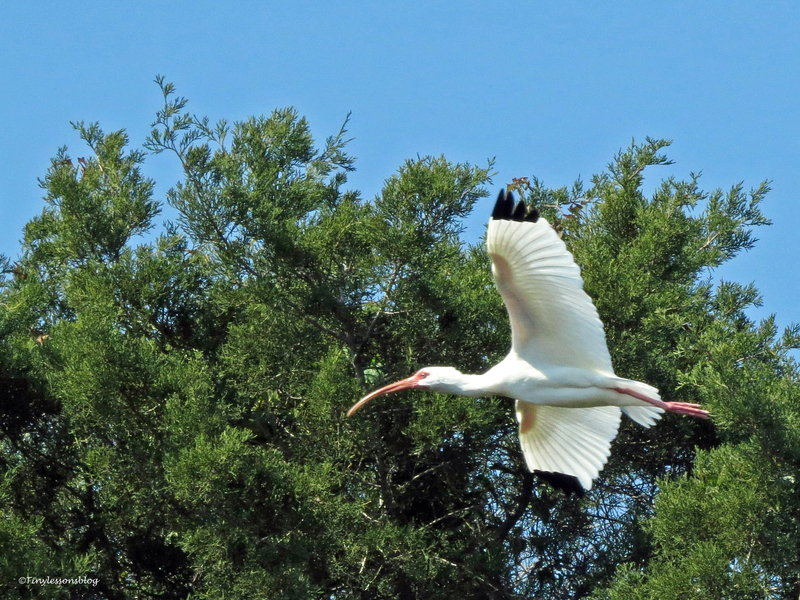 A White Ibis flies to the bay side. 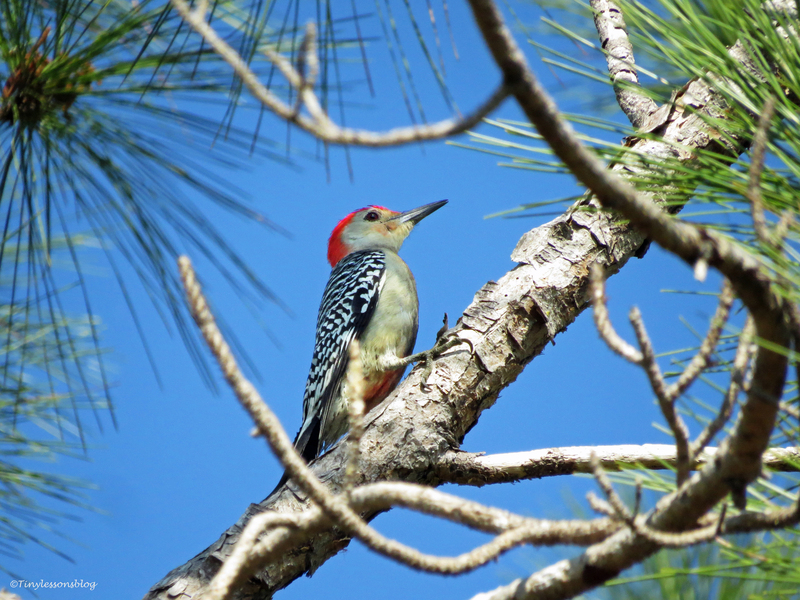 The Red-bellied Woodpecker works in a pine tree close to his condo home. 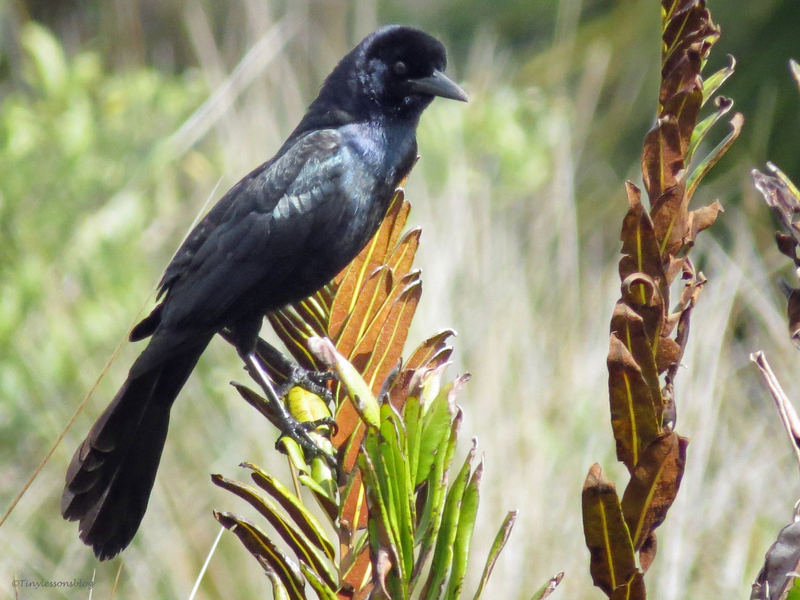 A Boat-tailed Grackle observes the goings-on in the marsh. 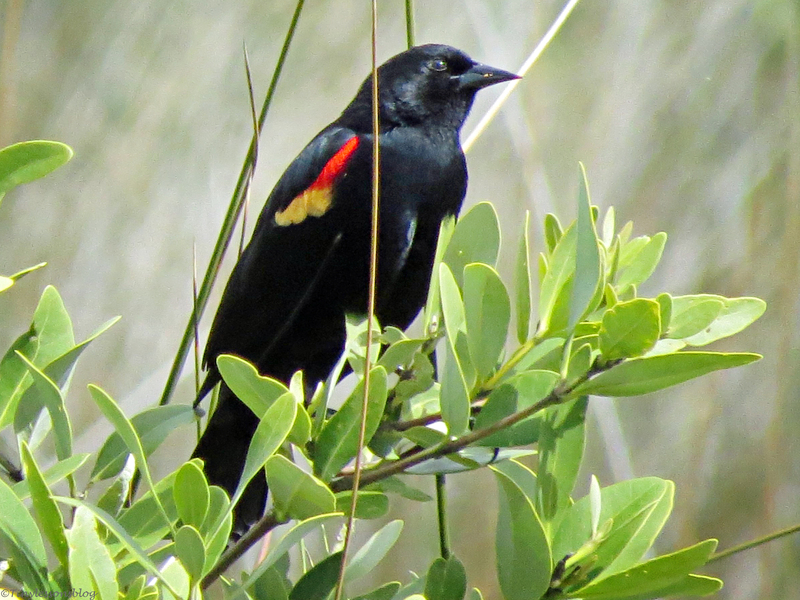 A Red-winged Blackbird is a new resident in the marsh. 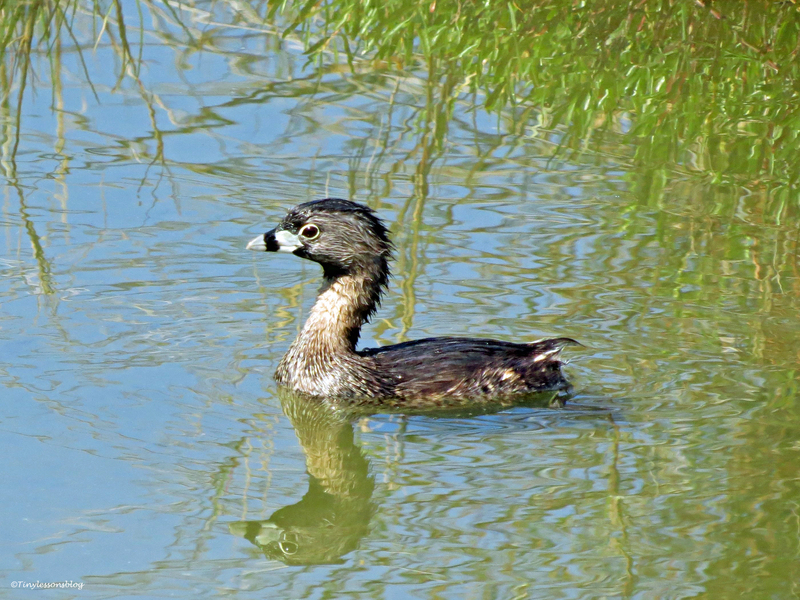 This tiny Pied-billed Grebe lives in the marsh with her mom and dad. As to Sandy and Stanley, they have spent the week doing what matters most. Family stuff. Protecting the nest, incubating, bathing, preening, exercising, inspecting the egg(s) and feeding. The other day I happened to witness a food transport. Papa Stanley was returning from a fishing trip over the ocean. Delivering a nice fresh fish to Mama Sandy. 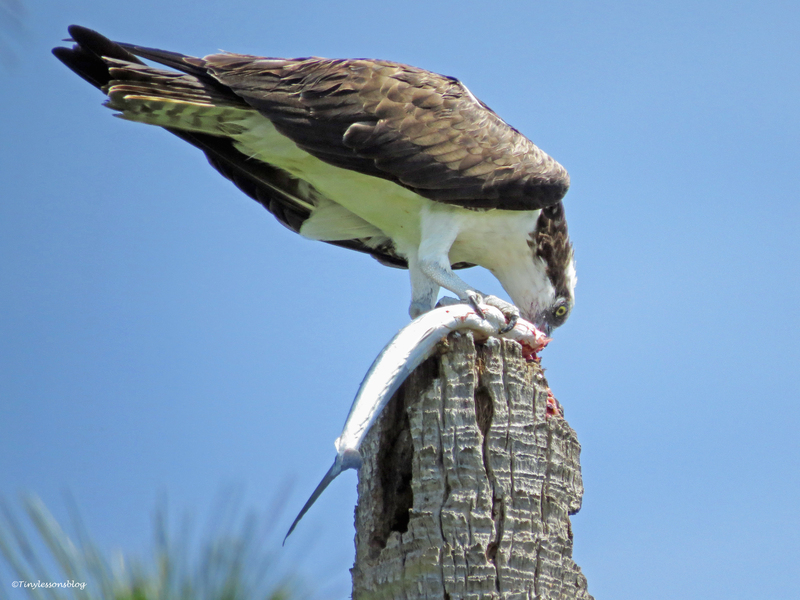 Papa Osprey delivers fresh seafood…a small fish. They quickly changed shifts. Stanley sat on the eggs and Sandy took the fish and flew off to the lamp-post close by to enjoy it. 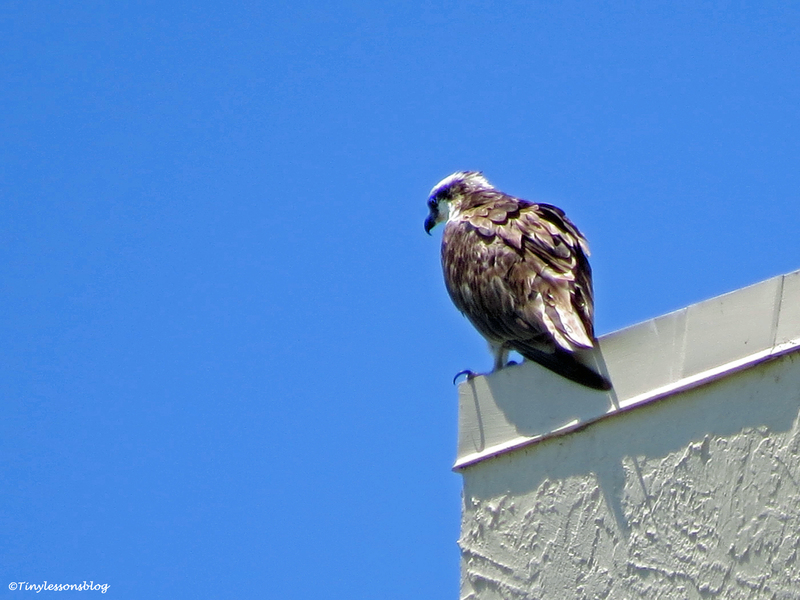 Mama Osprey enjoys her food on a nearby lamp-post. 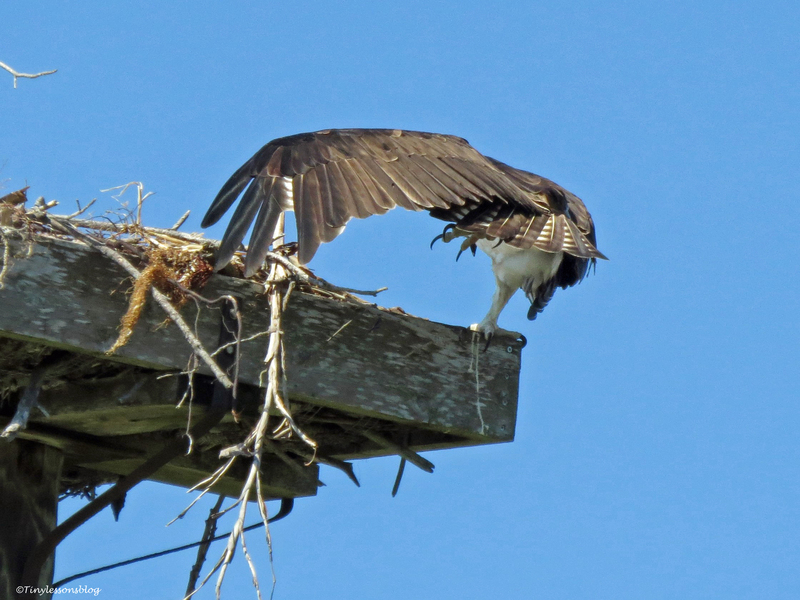 She then returned to the nest and did her pilates balancing on the edge. Stretching her arms and legs in turn. 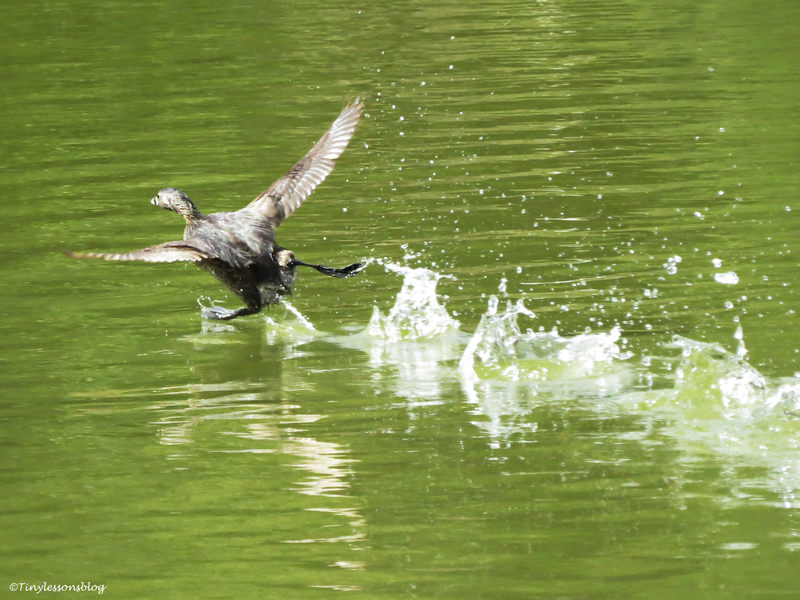 Followed by light flying exercises around the marsh. 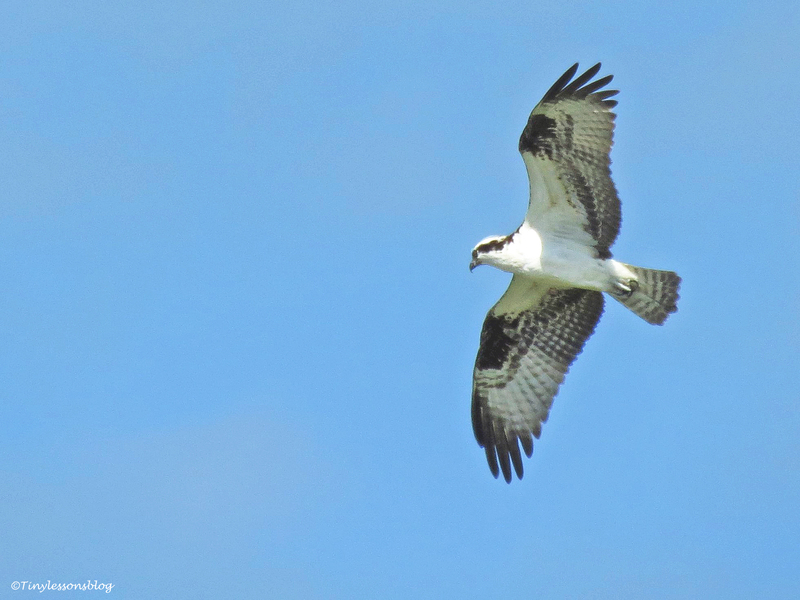 Mama Osprey flies around the marsh just to get some exercise. I wish them…and you all a wonderful weekend! I’ll catch up on your blogs next week as soon as I return. Spring Break. Man Cave Rentals and Guard Duty. This week has been warm. Spring-like. Birds are courting and building nests. 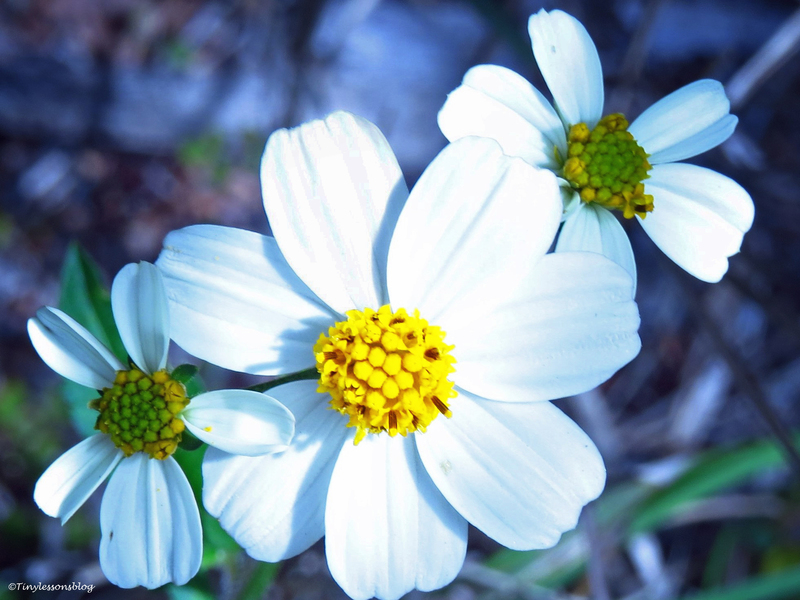 Wild flowers are blooming in the salt marsh. And spring-breakers are everywhere. 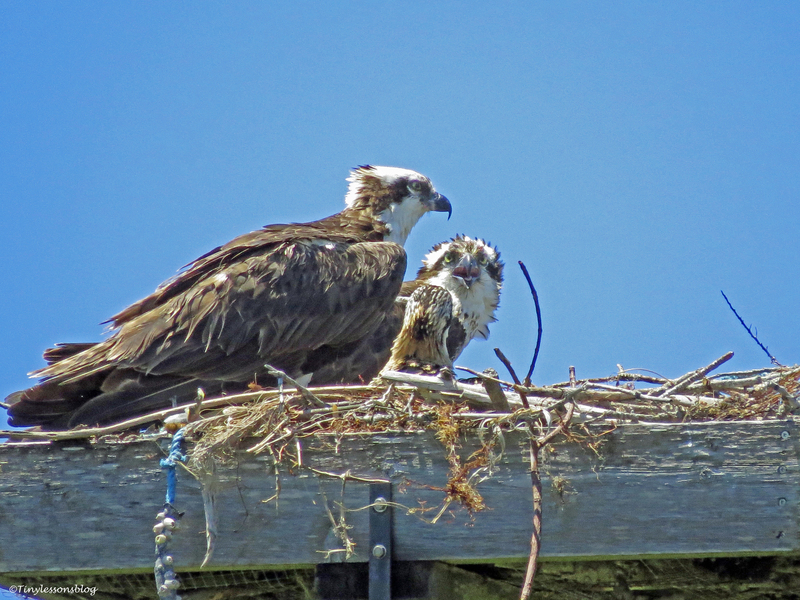 The Osprey Family is not taking a spring break. 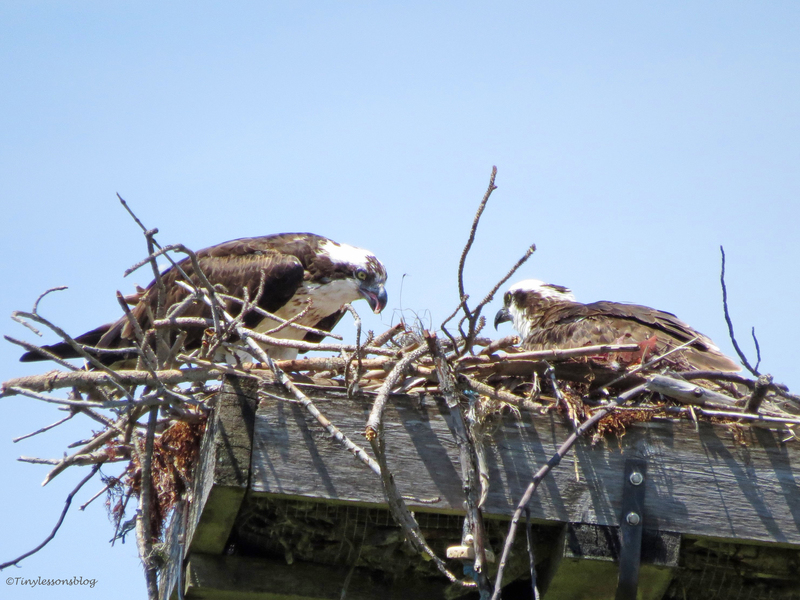 Sandy and Stanley continue to incubate in shifts. Mama Sandy’s shifts seem to be little longer, and she always takes a bath whenever she gets some time off. Then dries herself in the sun, sits on the egg(s) again and asks Papa to go fishing. They seem to have established a regular routine to be interrupted only by Papa Stanley’s guard duty when a potential intruder approaches the nest. I’m happy to report that the Great Blue Heron has not repeated his attack on the nest. He’s still keeping an admirably low profile at the opposite end of the marsh. But Steve didn’t give up. He kept circling around the nest. And finally Stanley had no choice but to chase him away in person. …and Papa Stanley decides to chase him away. Papa Stanley still enjoys his man cave, but spends more time in the nest now. And lets feathery spring-breakers rent his perch from time to time. 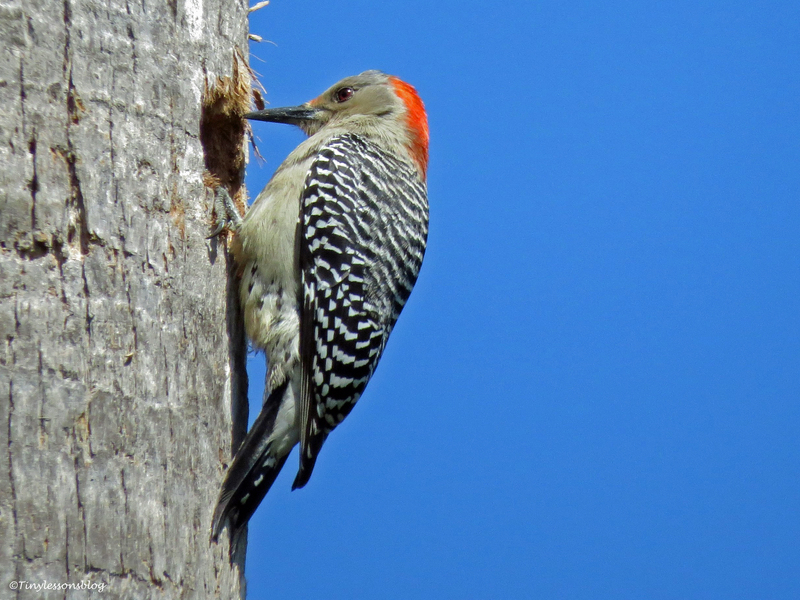 A Red-bellied Woodpecker has been working on his little apartment in the same old palm trunk for a few days now, and today he finally moved in. He appeared to be very pleased with his new home. I’m sure Stanley will be a good neighbor. And a good dad. Maybe already next week if my estimates are about right. 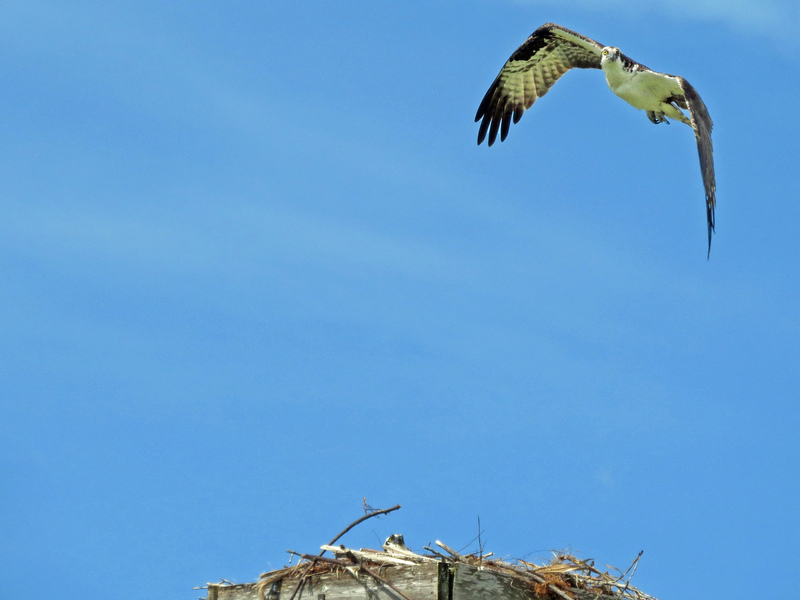 Papa Stanley flies over the nest to check on Mama. And he definitely is a good hubby. Today, directly after the shift change at noon, he flew away. I’m guessing to take a bath. 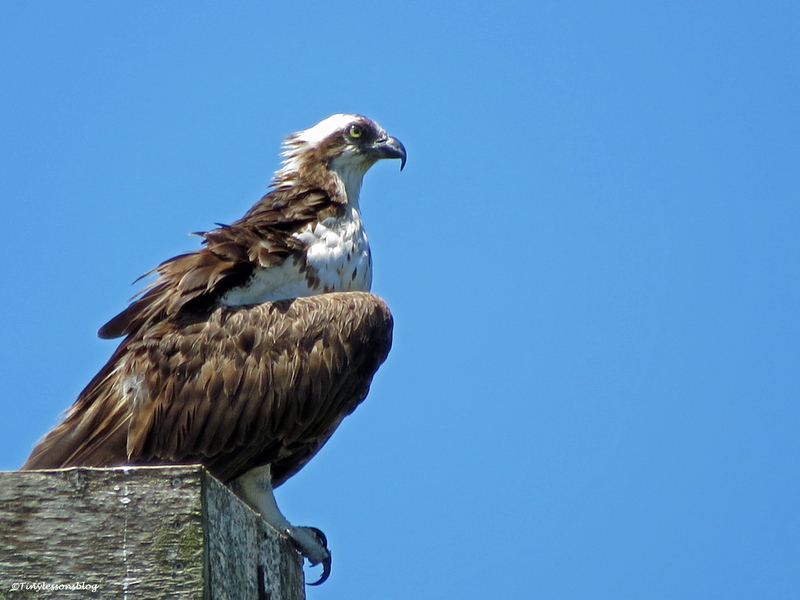 But he came back shortly and flew over the nest just to check on Mama before going to fetch some fish for lunch.